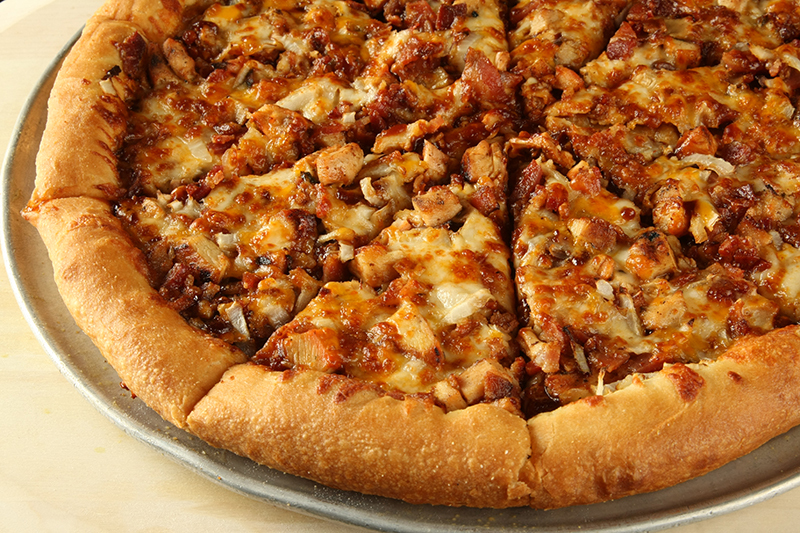 Choice of: Plain, Mild, Inferno, Buffalo, BBQ, Teriyaki, Hot & Spicy Garlic, Cajun or Parmesan Garlic. Sliced vine ripened tomatoes, basil and fresh mozzarella cheese drizzled with extra virgin olive oil and balsamic vinegar. 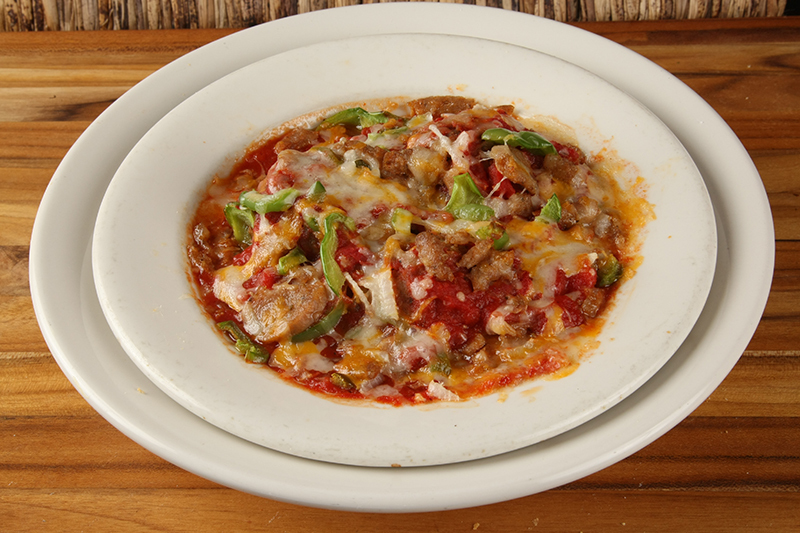 Chopped Italian sausage & our spicy meatballs, topped with mozzarella, baked in marinara with green pepper & onion. Served with plenty of garlic bread (Feeds 3-5). 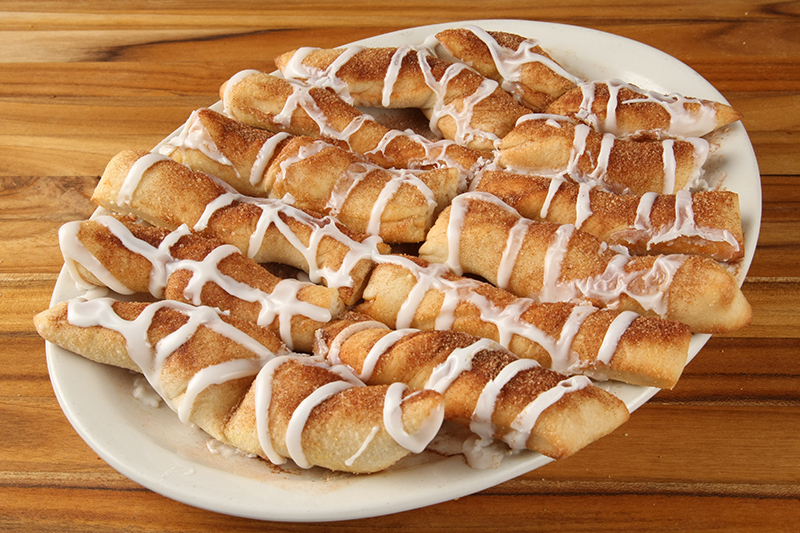 Bread stix buttered & covered with cinnamon sugar. Topped with vanilla icing. Homemade bread twisted & baked to perfection. 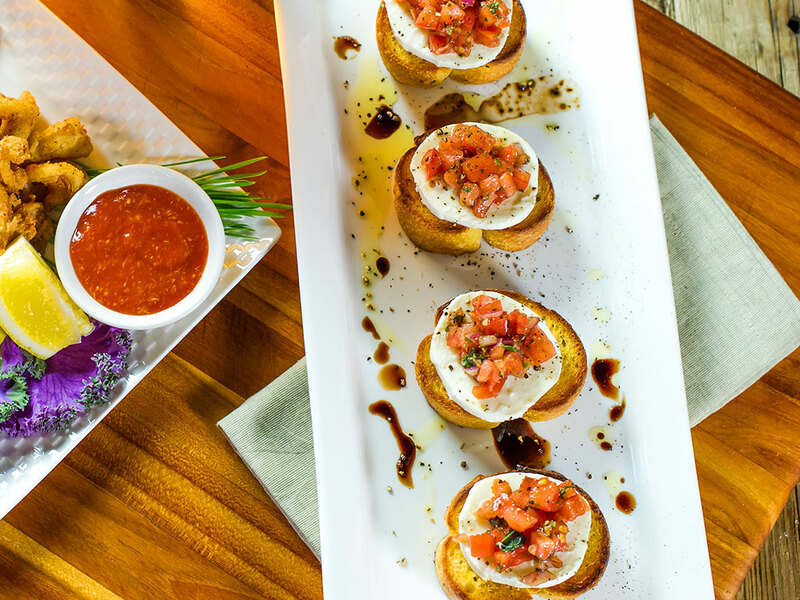 Brushed with garlic butter & served with a side of marinara, ranch, or chipati sauce. 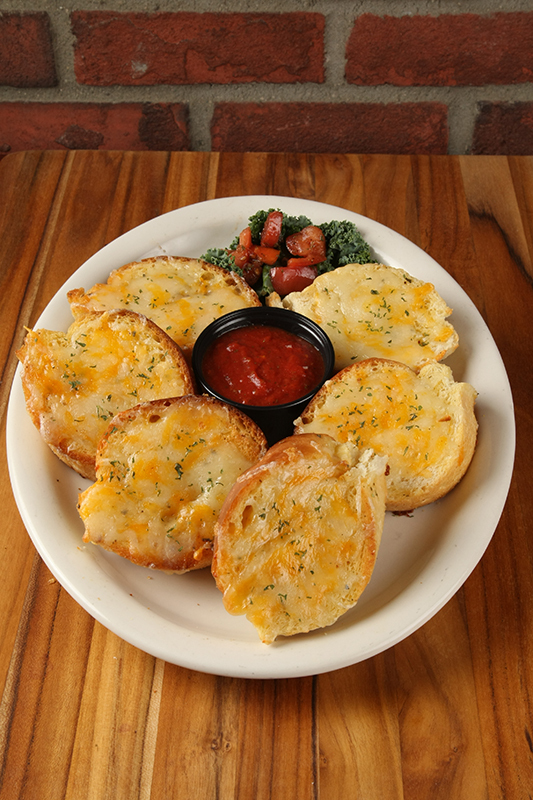 Brushed with garlic butter & topped wth mozzarella, muenster, cheddar & parmesan. Baked to perfection. Served with a side of marinara, ranch, or chipati sauce. 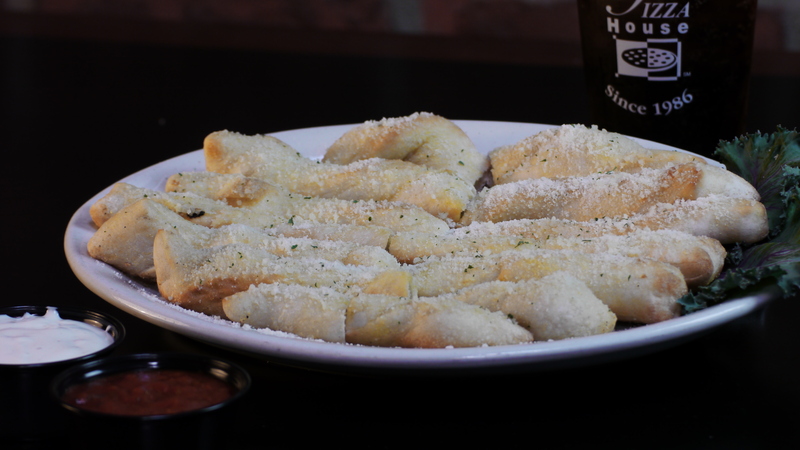 Our original bread stix stuffed with plenty of pepperoni, served with side of tomato sauce or ranch dressing. 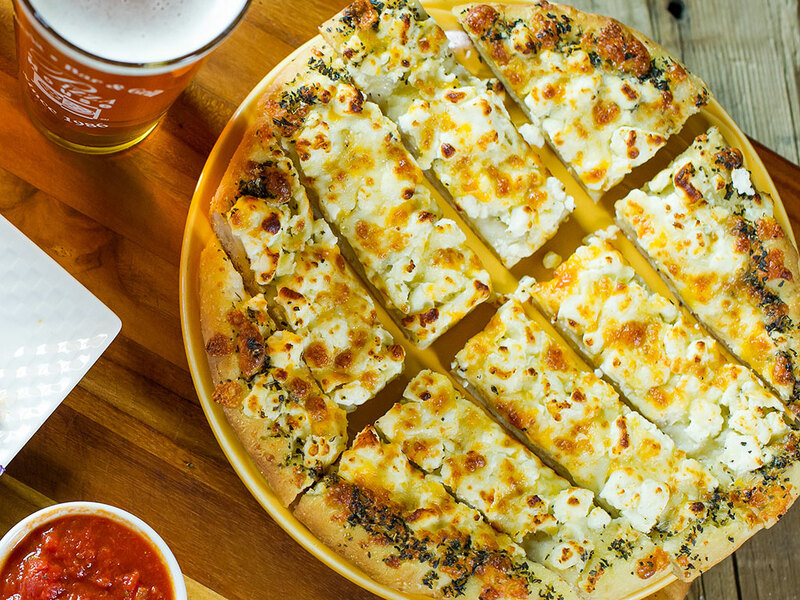 Our same tasty bread stix sprinkled with fresh feta cheese and topped with mozzarella, muenster, cheddar & parmesan. 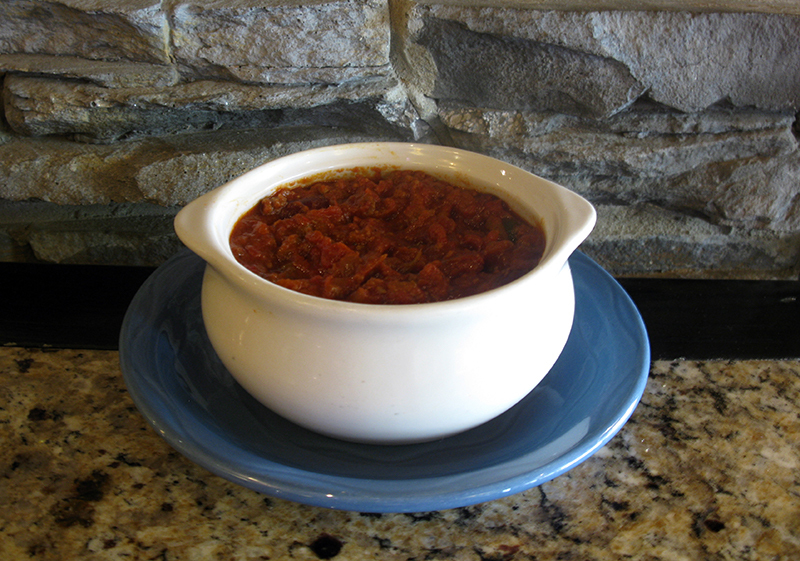 Oven baked and served with side of marinara, ranch or chipati sauce. 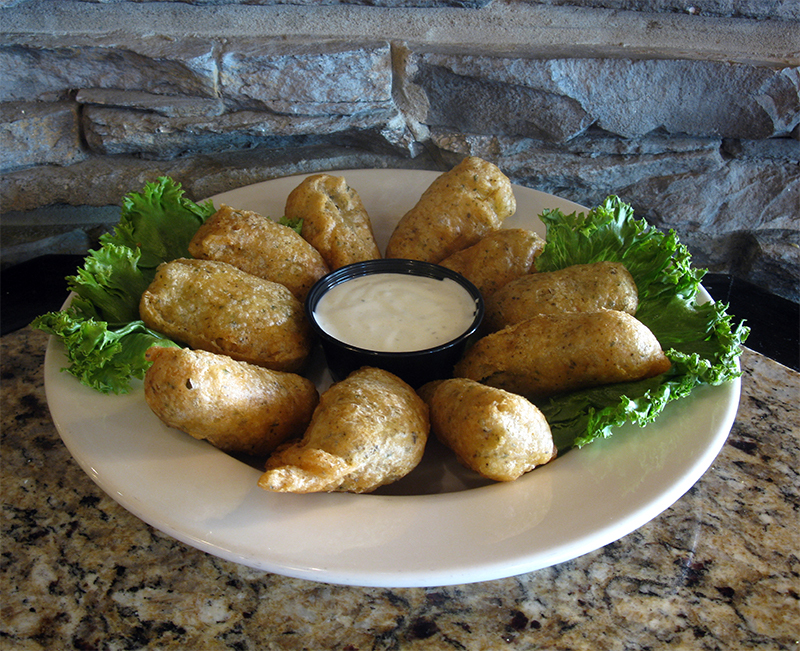 Jalapeno poppers filled with cream cheese, lightly breaded & deep fried to a golden brown with side of ranch. 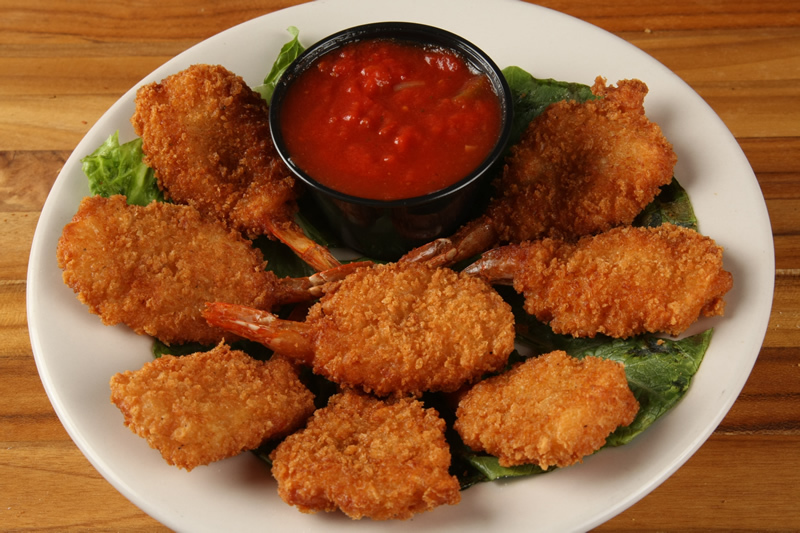 Breaded, deep fried, tail on shrimp. Served with cocktail sauce. Battered & deep fried. Served with ranch. 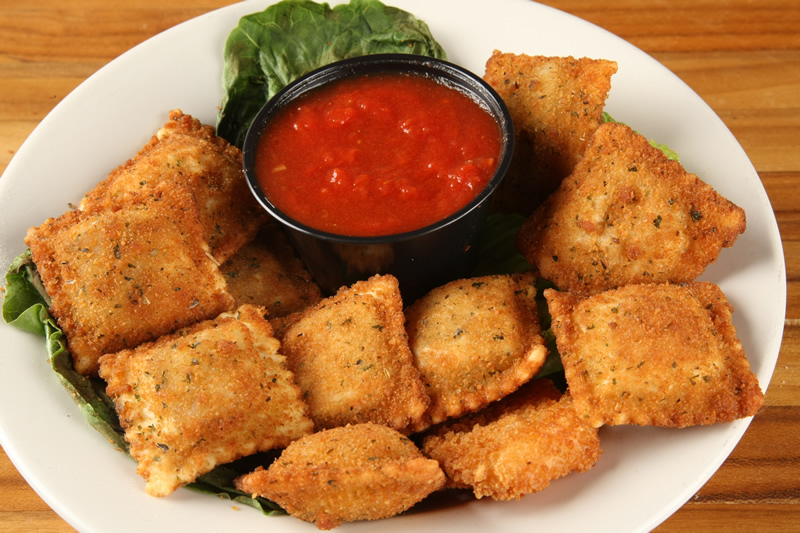 Lightly breaded & toasted Ravioli stuffed with Italian sausage & blended cheeses. Served with marinara. 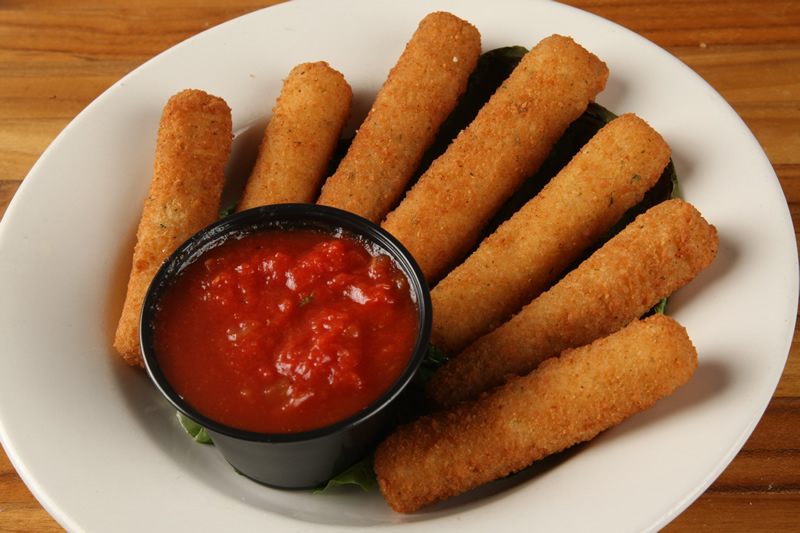 Deep fried battered Mozzarella served with a side of marinara, ranch or honey mustard. 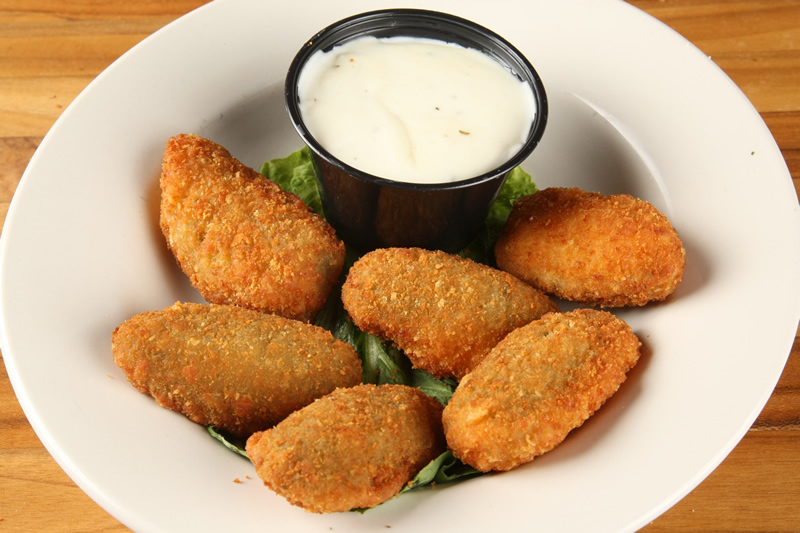 Dill pickle spears breaded & deep fried. All-white meat chicken, lightly breaded and deep-fried to perfection. Very tasty! With side of ranch, honey mustard, or BBQ sauce. 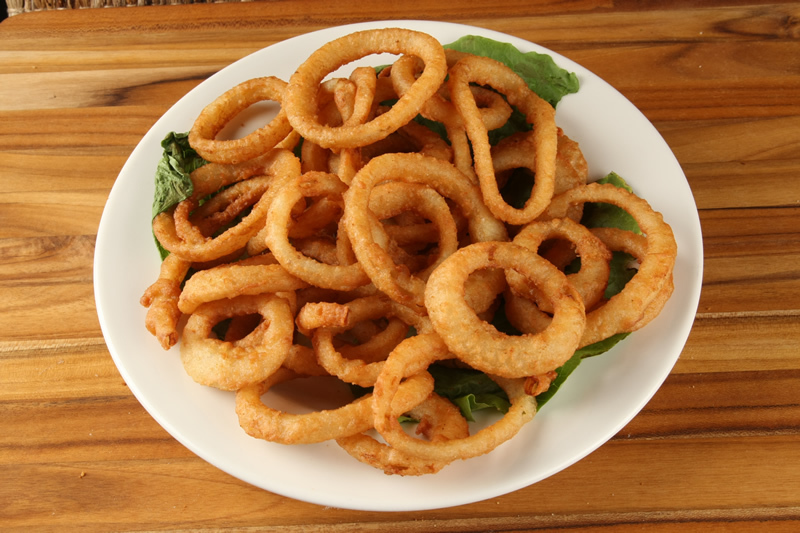 Tender domestic Calamari in milk, lightly battered and fried to a crispy golden brown, served with lemon and marinara sauce! A selection of your favorites! Serves 6-9. Calamari, Chicken Wings, Fried Mozzarella, Chicken Tenders, Fried Ravioli, Fried Shrimp and Jalapeño Poppers. Please no substitutions. Served with marinara and ranch. Topped with a generous portion of blended cheeses with roasted garlic and a side of marinara. Italian white bean hummus, chopped tomatoes, cucumbers and roasted garlic. 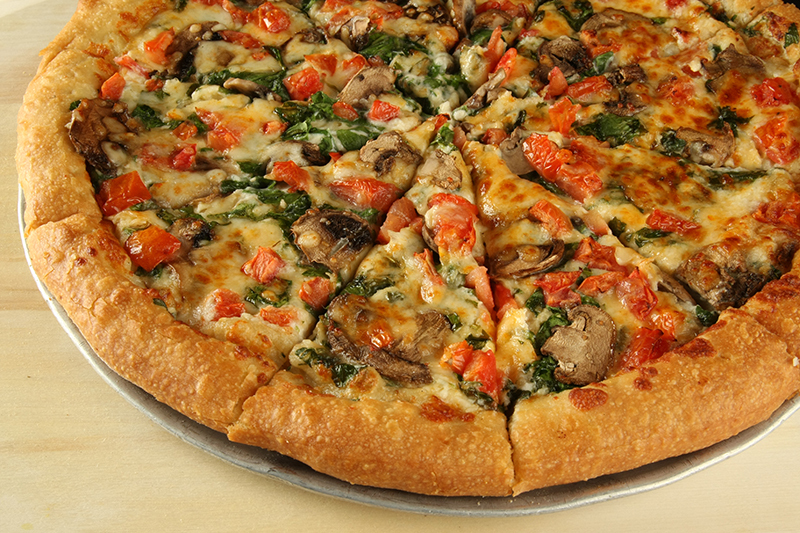 Served with layered mozzarella and gorgonzola cheese, with portobello mushrooms, alfredo sauce and roasted garlic. 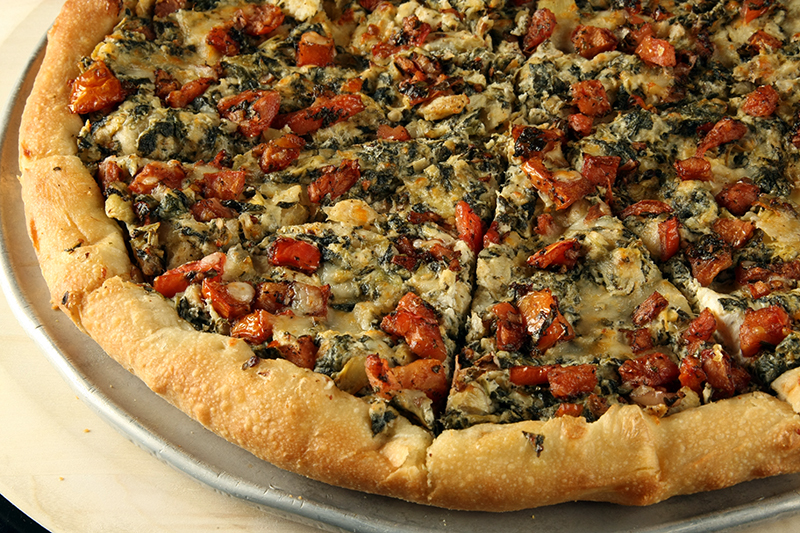 Artichoke hearts, spinach, roasted garlic, mozzarella, romano and cream cheeses. Fresh chopped tomatoes, basil, roasted garlic and fresh mozzarella drizzled with balsamic vinegar. 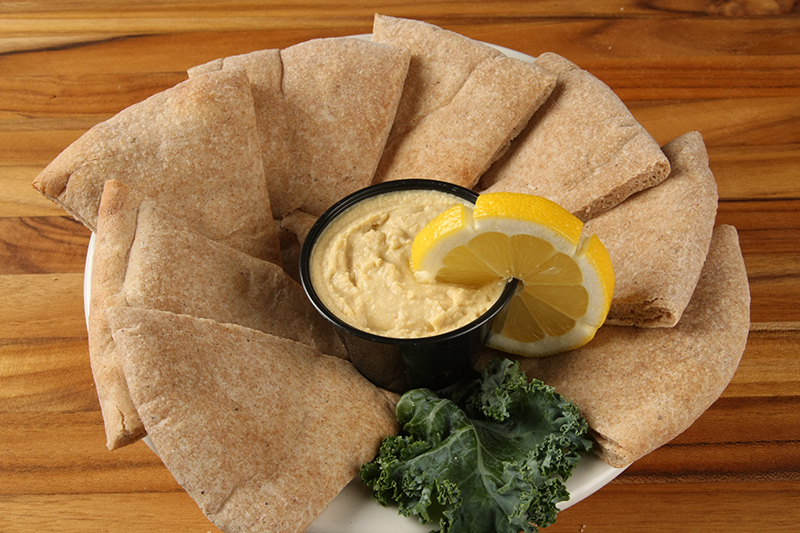 Our original recipe of white beans pureed with sesame, garlic, lemon and spices. Served wih whole wheat pita bread. 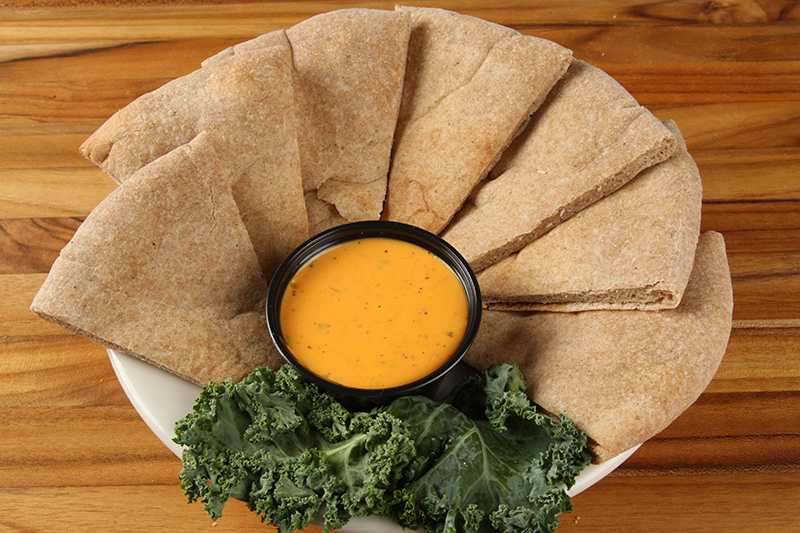 Our famous whole wheat pita bread, fresh out of the oven. 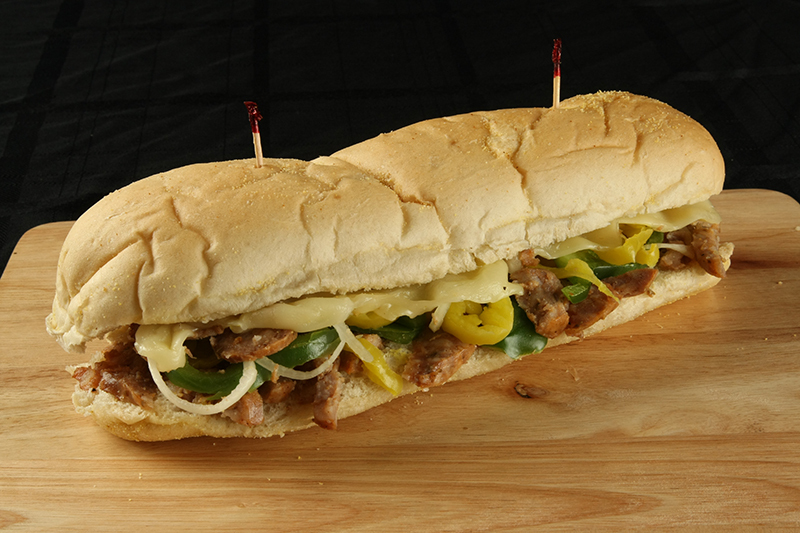 Served with chipati sauce, ranch or honey mustard. 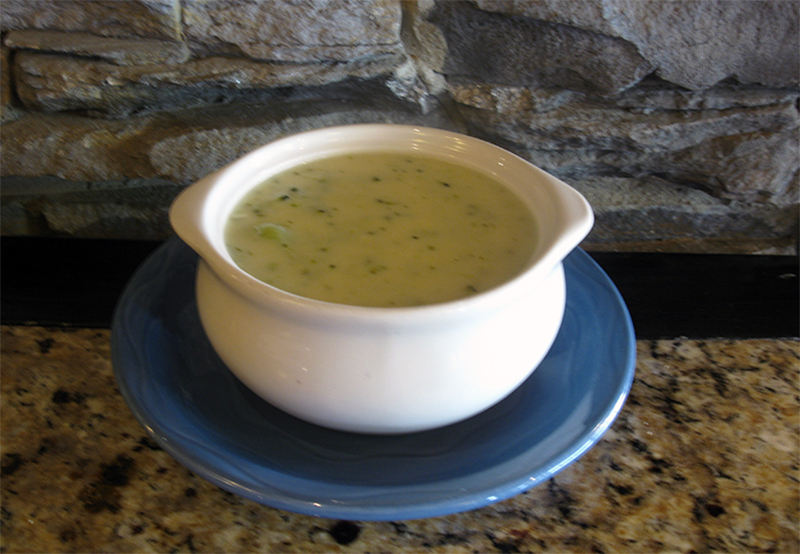 Cream of broccoli or Soup of the Day. Tasty mini burgers topped with American Cheese. Onions, green peppers and jalapeños immersed in mozzarella Muenster and cheddar cheeses baked between two flour tortillas. Served with side of salsa and sour cream. If you haven't heard, they're the best! In select flavors. Home of the world famous CHIPATI! 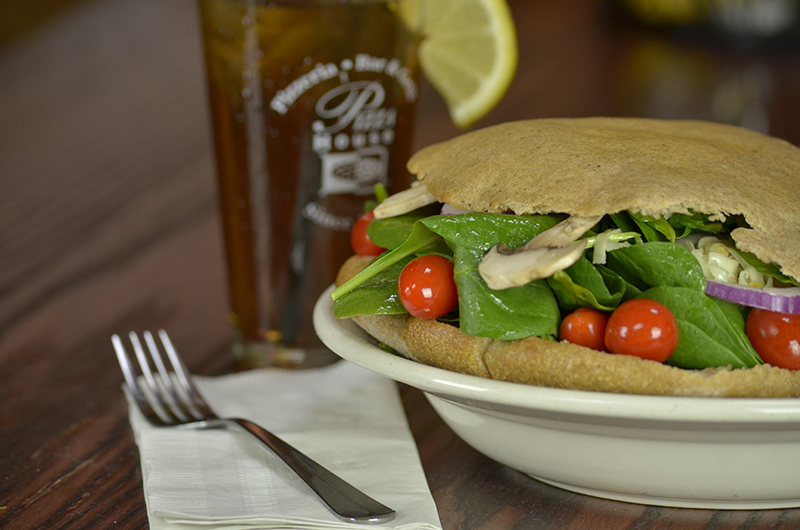 Warm, thick homemade Whole Wheat pita baked fresh to order then stuffed with salad greens and fresh cut veggies. White pita available upon request. 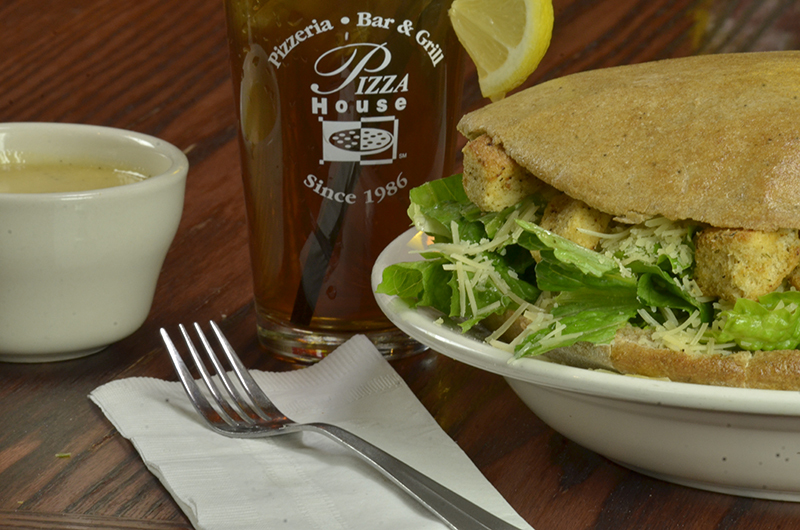 Whole wheat pita stuffed with fresh cut romaine, parmesan, croutons. 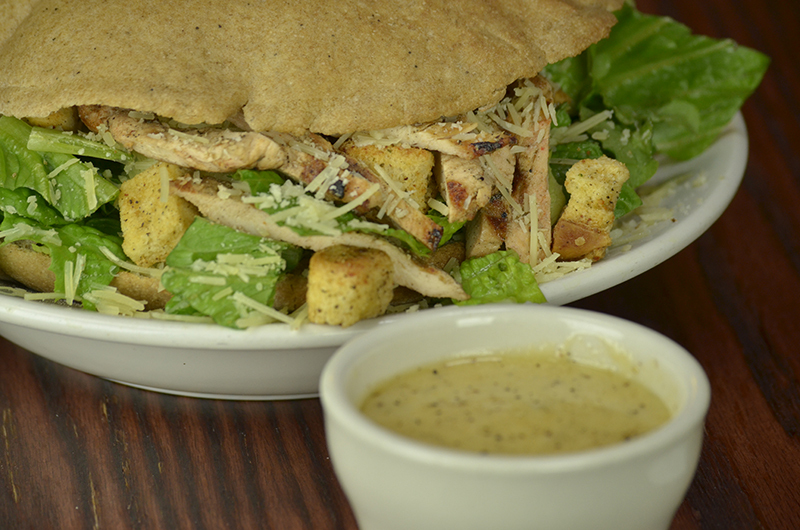 Caesar dressing on the side! Blend of spinach, tomatoes, red onions, mushrooms ad mozzarella stuffed in a pita with greek dressing. 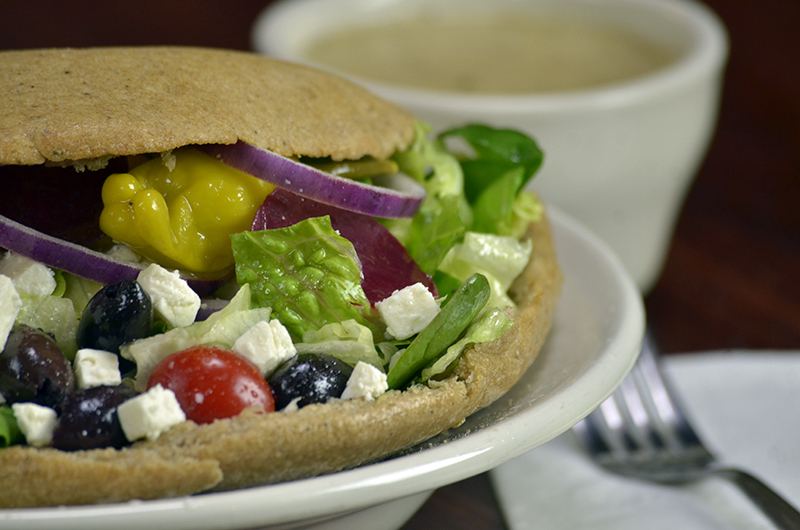 Whole wheat pita stuffed with salad greens, feta cheese, beets, pepperoncini, red onion, kalamata olives & tomato. 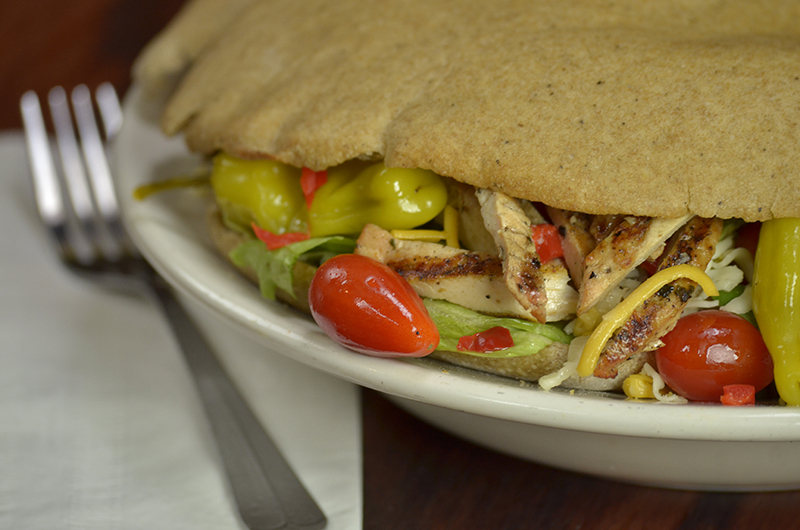 Whole wheat pita stuffed with salad greens, green pepper, sweet red pepper, mushrooms, tomato & mozzarella, topped with grilled chicken breast. Ranch dressing on the side. 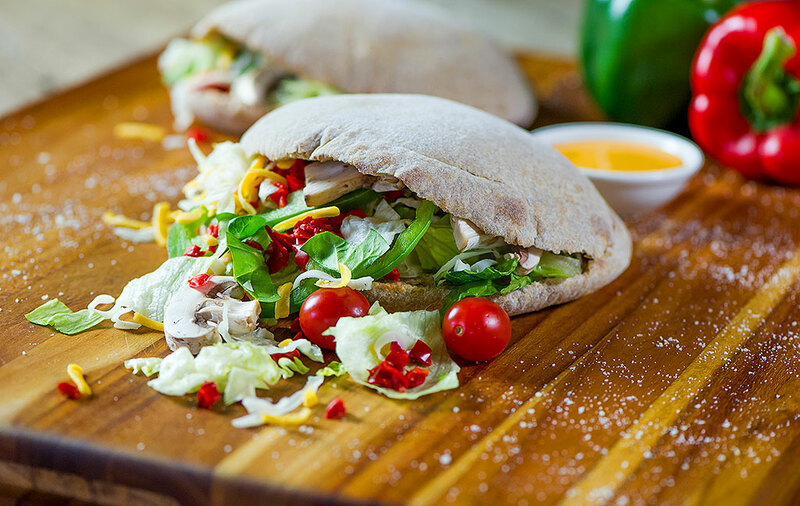 Whole wheat pita stuffed with salad greens, green pepper, sweet red pepper, mushrooms, tomato and mozzarella, topped with sliced turkey breast. With choice of dressing on the side. Whole wheat pita stuffed with fresh gorgonzola cheese and red onions. Served with homemade honey dijon. 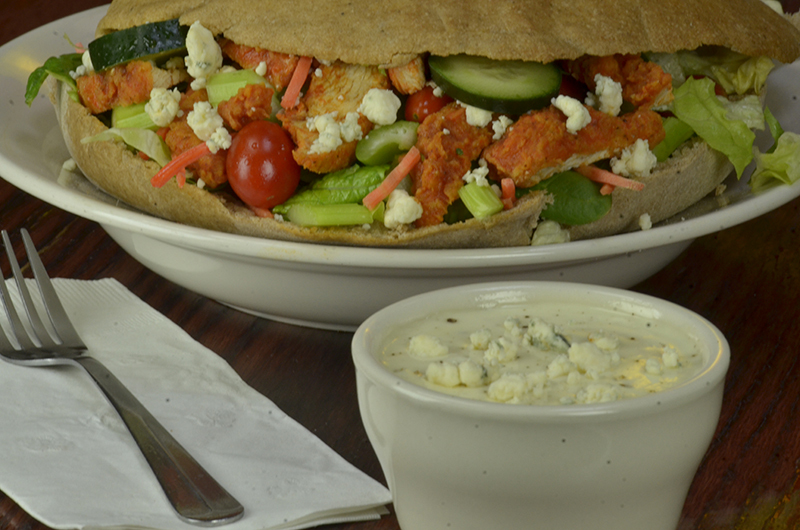 Whole wheat pita stuffed with salad greens, tomato, cucumber, carrots, celery and spicy Buffalo Chicken Breast topped with gorgonzola. Mini Salad – When just a little will do. 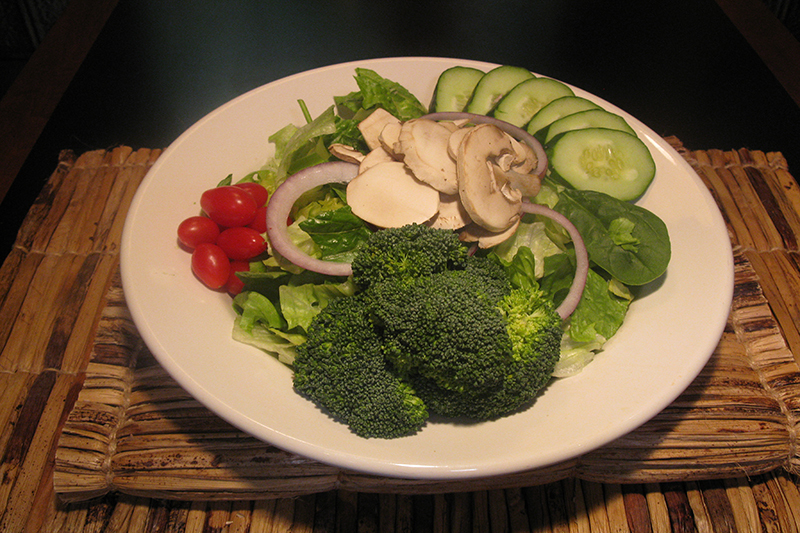 Lunch Salad – A perfect lunch sized portion or make great appetizer for two. 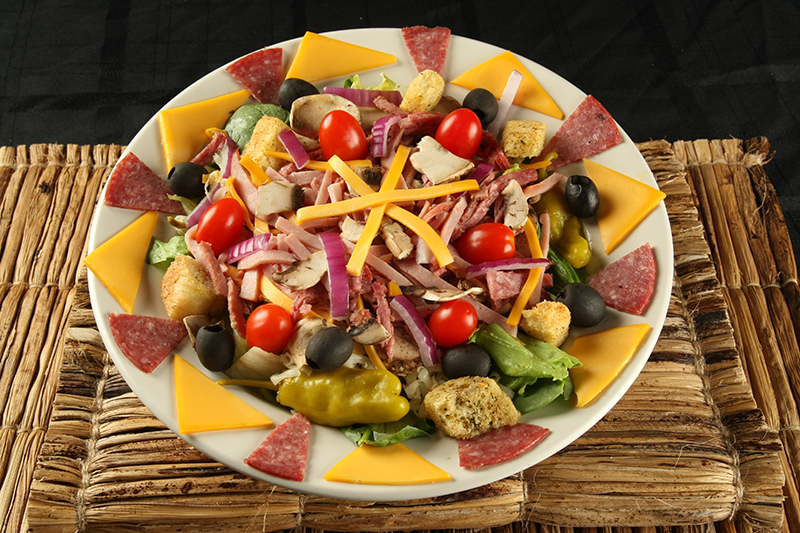 Entree Salad – Meal for one or an appetizer for up to four. French, Thousand Island, Homemade Italian, Ranch, Bleu Cheese, Classic Greek, Lite Raspberry Vinaigrette, Balsamic Vinegar, Homemade Honey Mustard, Caesar, Fat-free Ranch, Honey Dijon, Homemade Chipati Sauce. 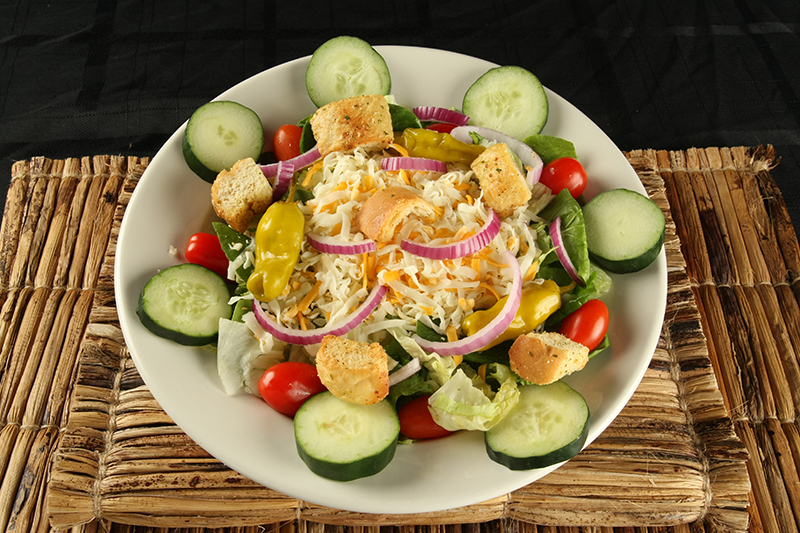 Salad greens, tomato, cucumber, pepperoncini, red onions, mozzarella & croutons. 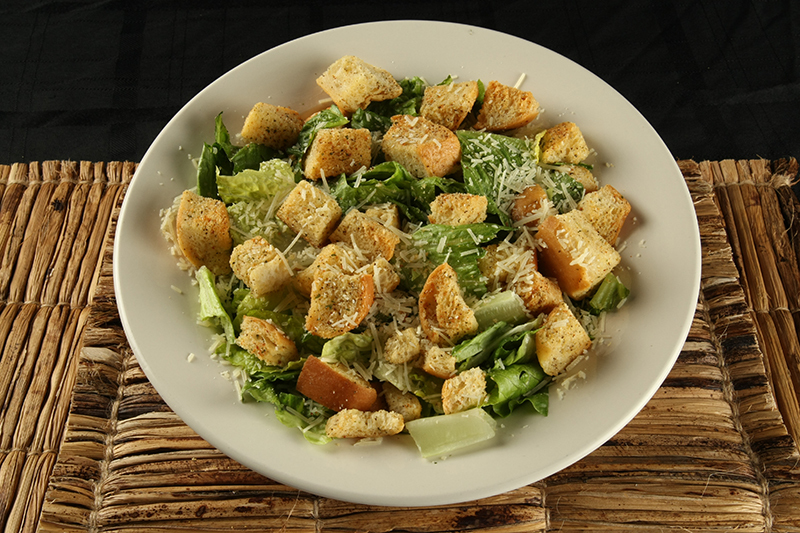 Fresh cut Romaine, parmesan cheese and croutons. 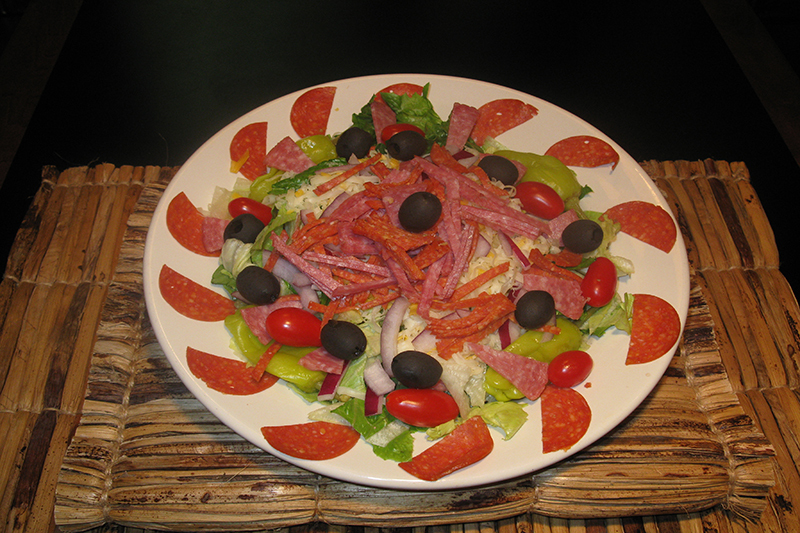 Salad greens, tomato, red onion, mushrooms, ham, salami, pepperoncini, american & mozzarella cheese with croutons on top. 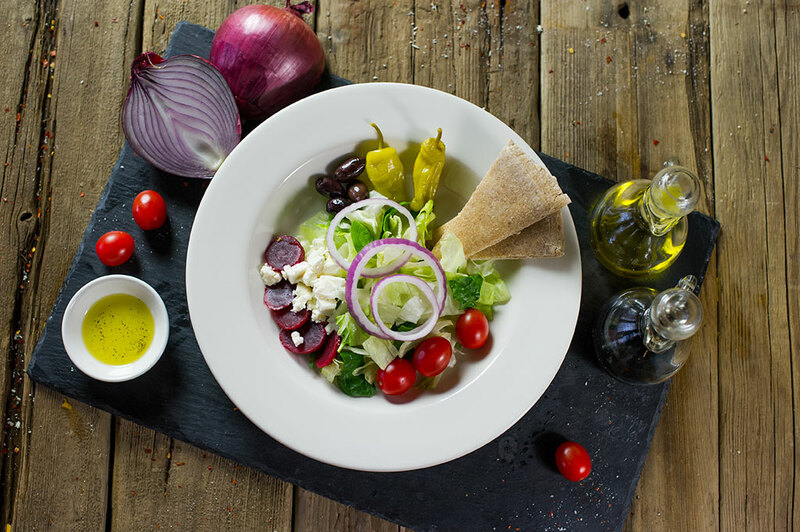 Salad greens, feta cheese, beets, pepperoncini, red onion, kalamata olives & tomato. 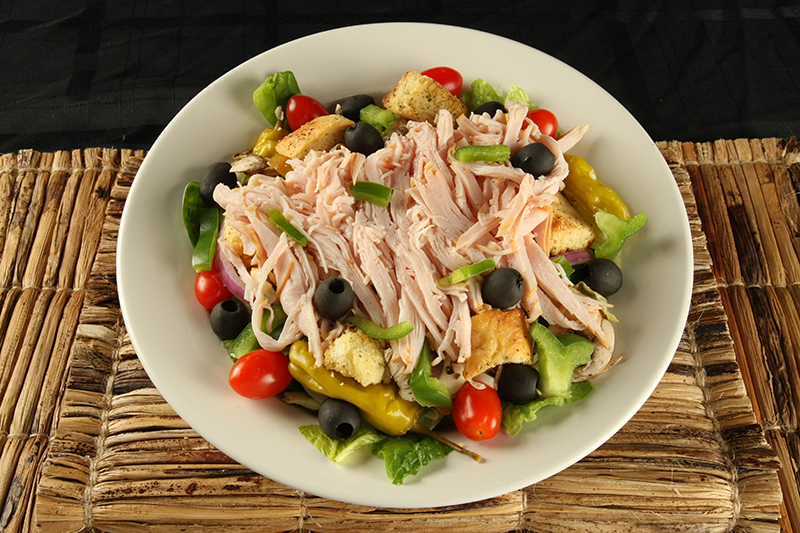 Salad greens, tomato, green peppers, mushrooms, red onion, pepperoncini, cheese, croutons & sliced turkey breast. 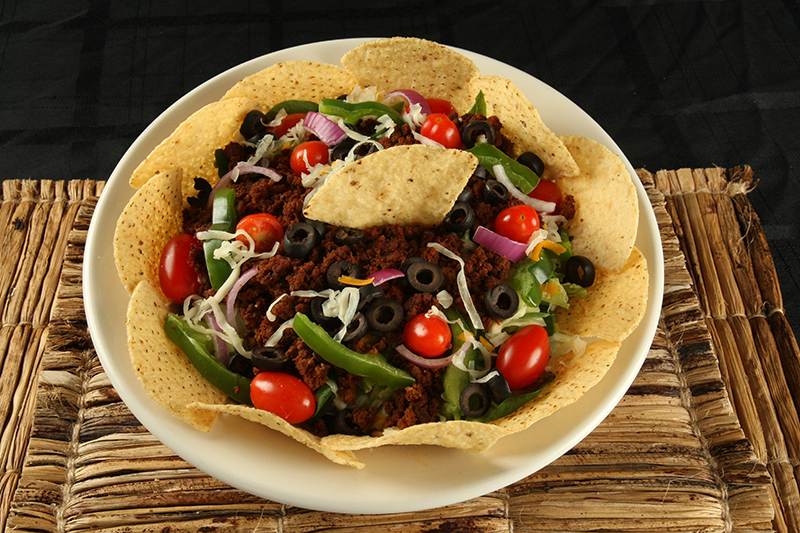 Nacho chips, salad greens, cheese, black olive, red onion, green peppers, tomato, spicy ground beef (with sour cream, salsa and chipati sauce). 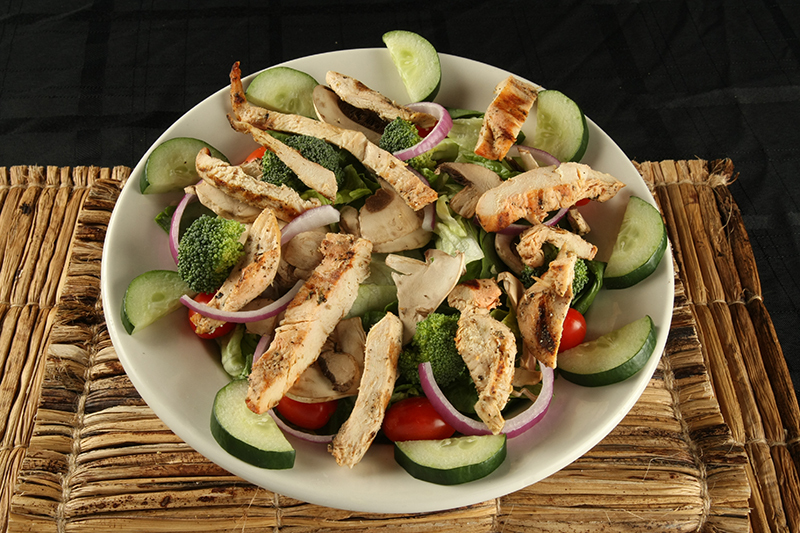 Salad greens, broccoli, mushrooms, red onion, cucumber tomato & grilled chicken breast. 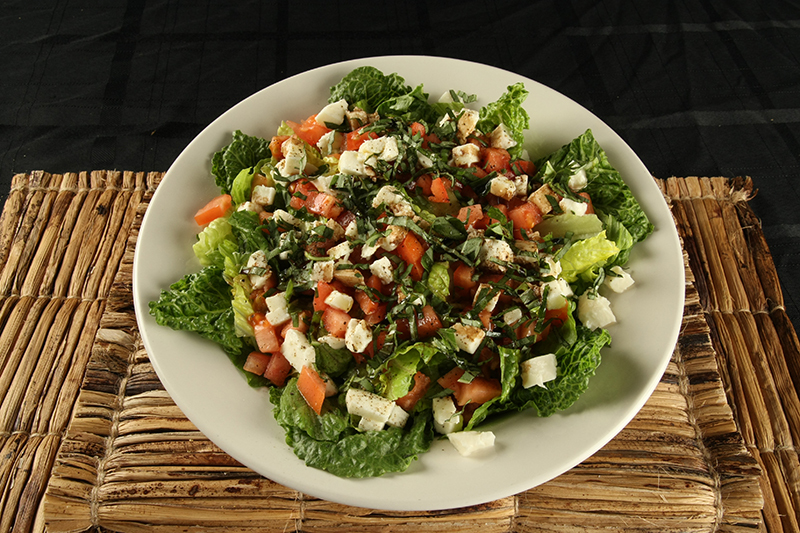 Fresh cut romaine topped with fresh mozzarella, diced tomatoes and fresh basil with balsamic vinegar & olive oil. 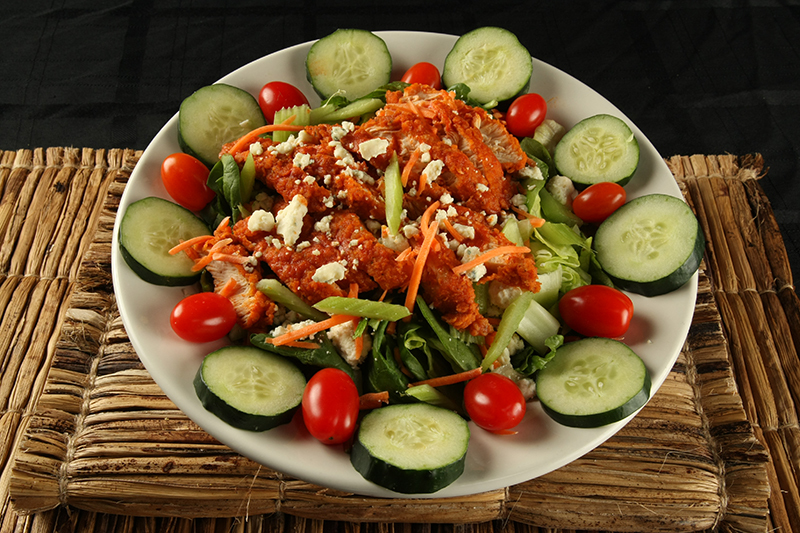 Salad greens, tomato, cucumber, celery and spicy Buffalo Chicken Breast topped with gorgonzola. Served with bleu cheese dressing. 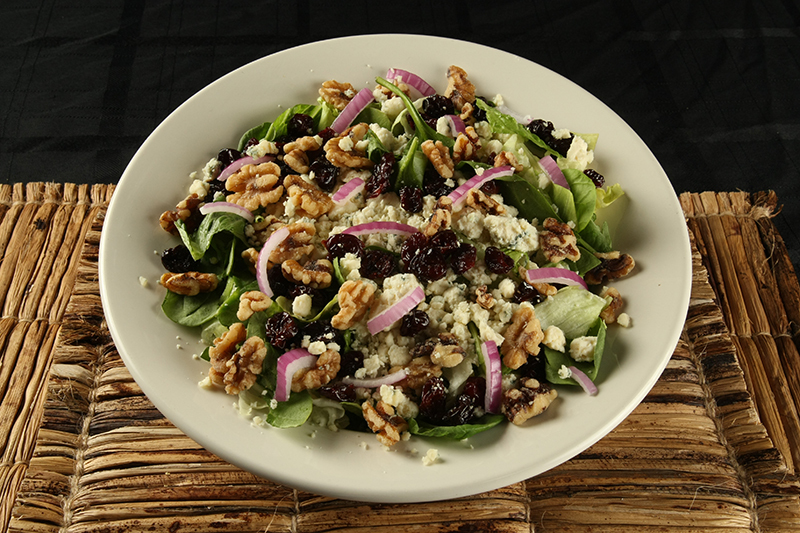 Fresh cut greens, dried Michigan cherries, chopped walnuts, gorgonzola cheese and red onions. Served with homemade honey dijon. 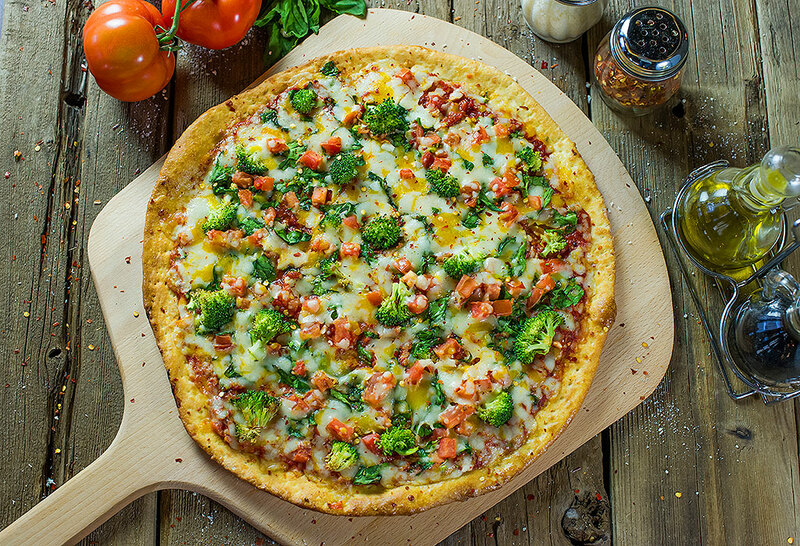 Using only enriched, white and whole grain flours, the freshest meats, poultry and produce available, topped with the finest Wisconsin cheeses, we will prepare a truly delicious pizza we’re sure you’ll enjoy! And of course items can be used in any combination. The choice is yours! 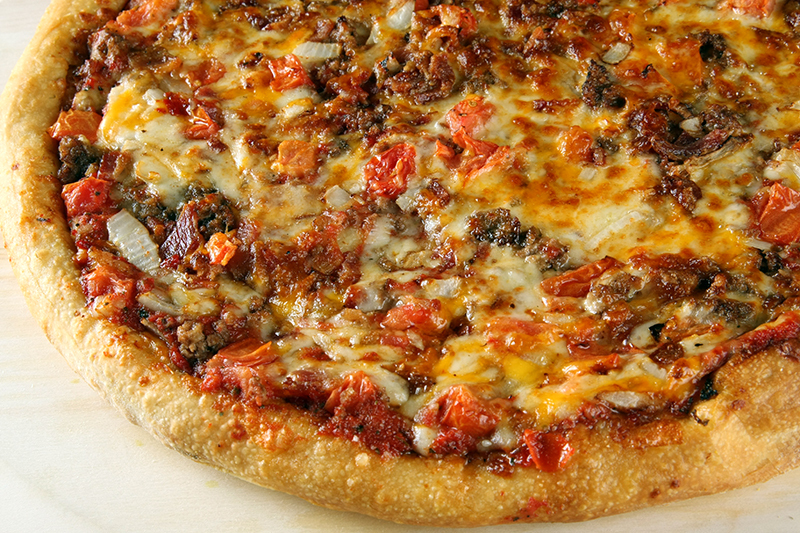 Chicago Style: Try either of our delicious Chicago style pizzas. 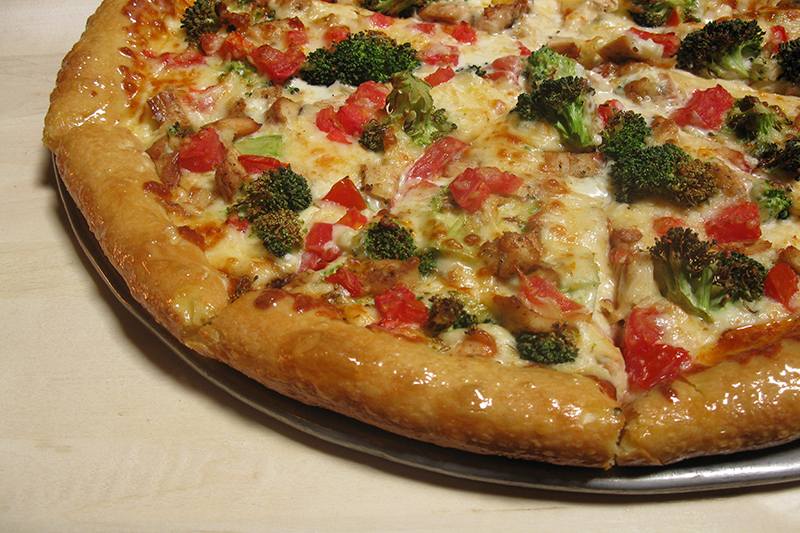 The world famous original deep dish or the hearty stuffed pizza version. 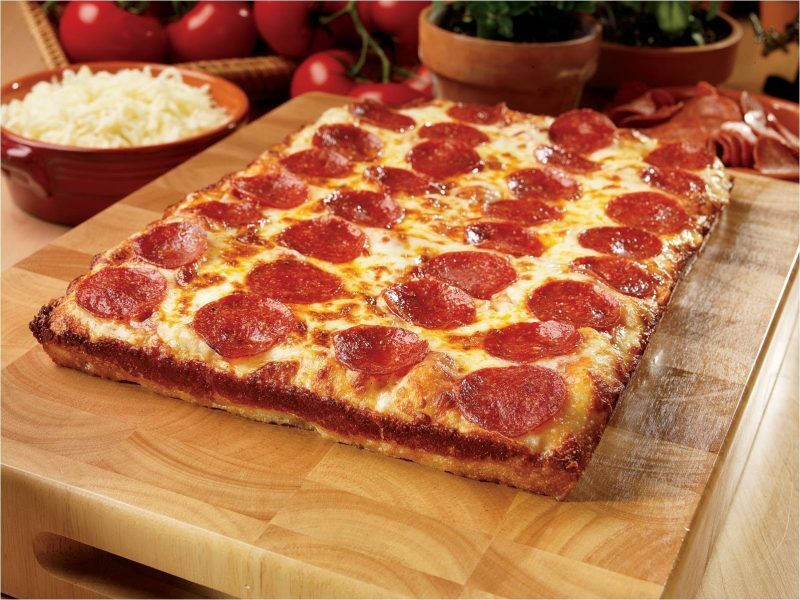 Thin Crust or Super Thin: Becoming very popular. Available in most sizes, just ask! 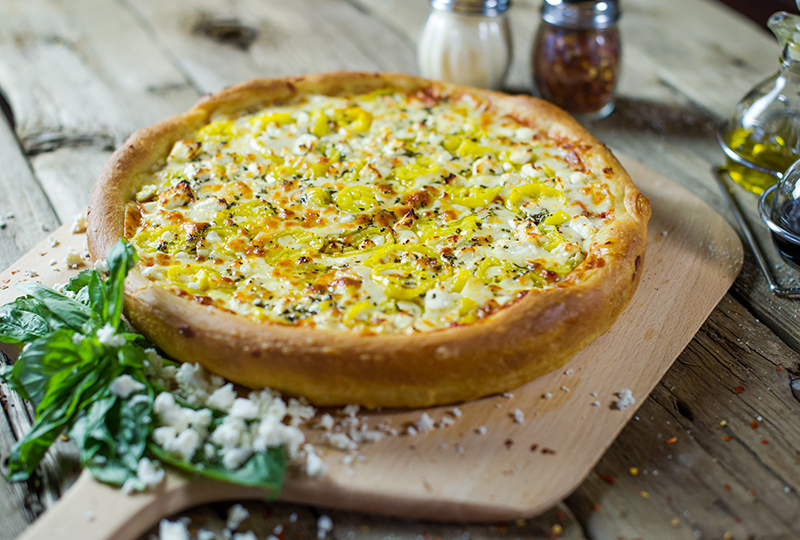 Free Tasty Crust Options: Garlic Butter, Butter, Butter Parmesan & Whole Wheat! 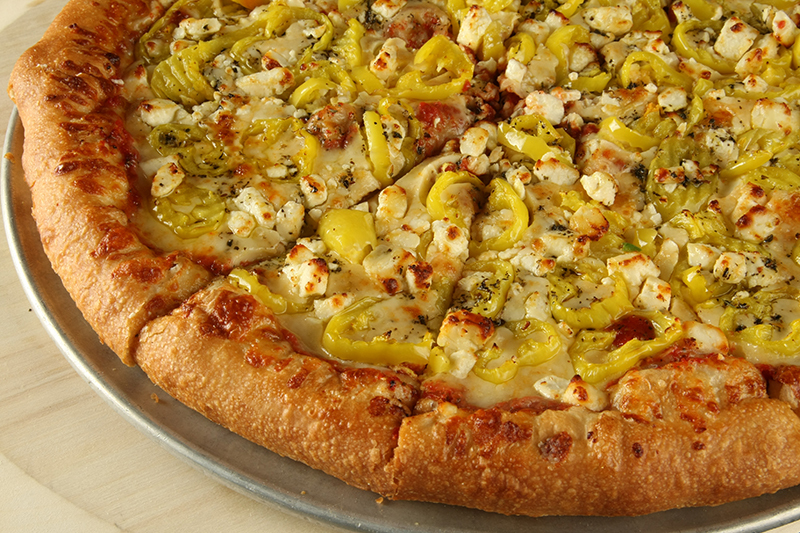 Cheeseless: We do pile on the cheese! So if cheese is not your thing, be sure to ask for “lite cheese” or “no cheese”. Both very tasty options! 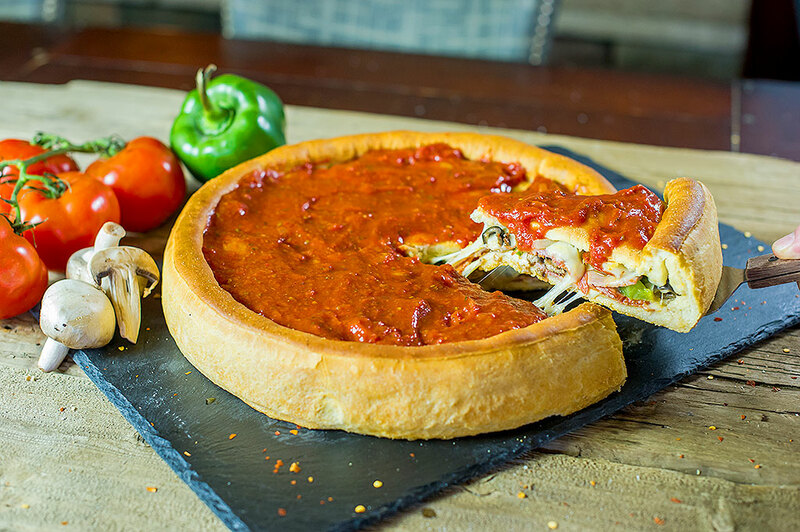 The original Chicago deep dish (25-30 minutes baking time). The famous original crusts we all know and love. Enjoy! 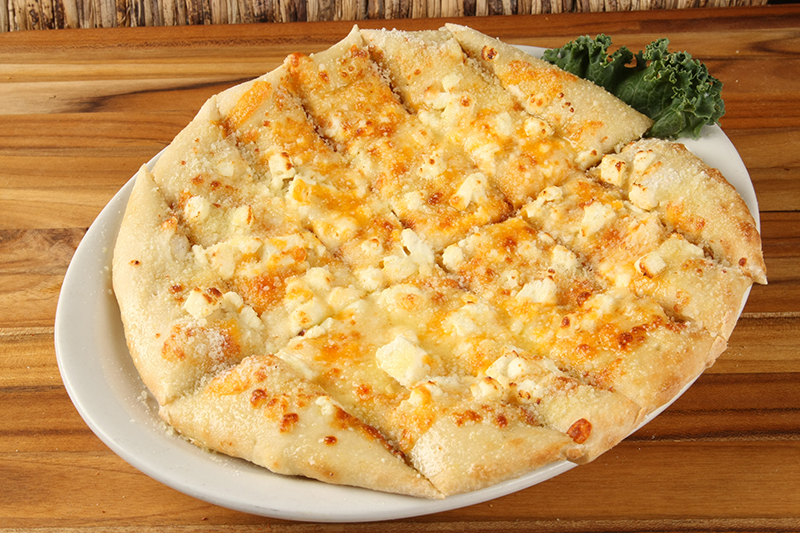 Our special blend of ricotta, mozzarella & muenster cheeses with choice of 3 items topped with pizza sauce. 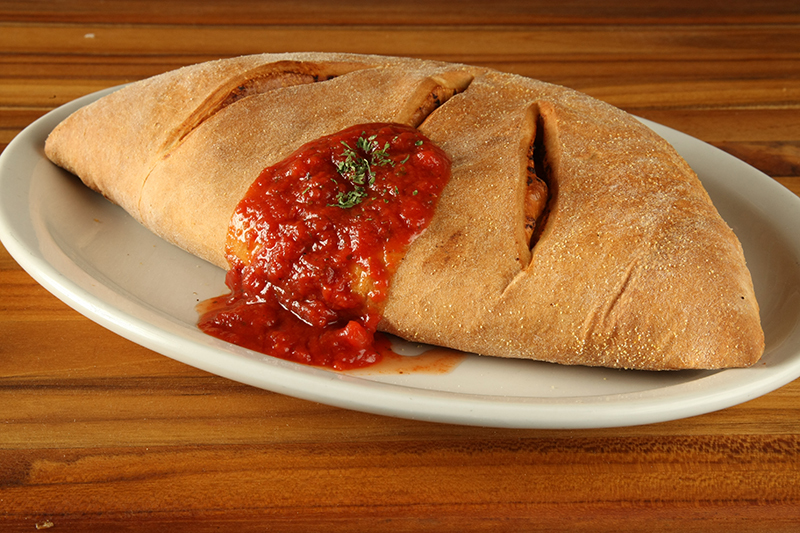 A pizza pocket stuffed with pizza sauce, mozzarella & your choice any 3 items baked to perfection. 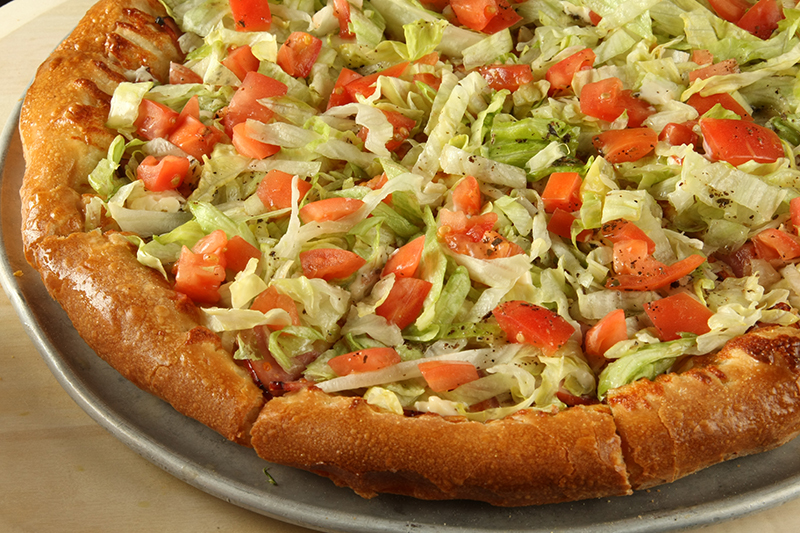 These tasty combinations can be ordered in any style or size! (charged as a 4 item pizza). 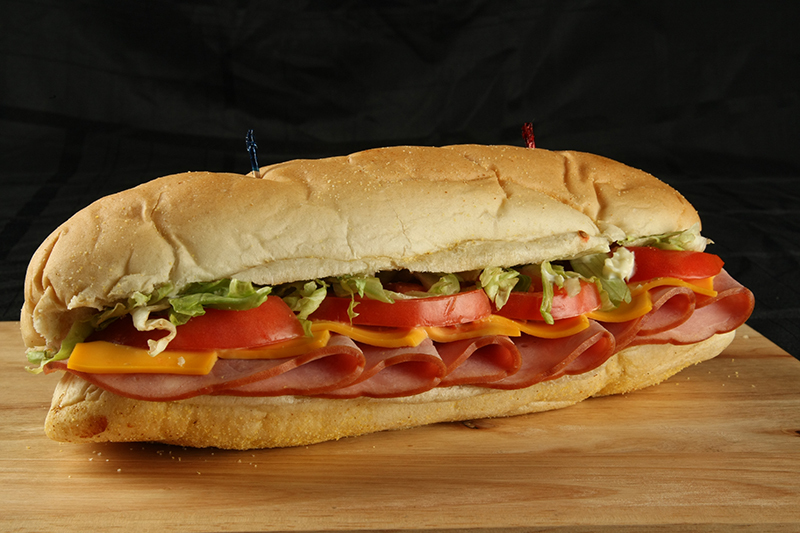 Ham, extra mozzarella, mayonnaise, lettuce, tomato topped with Italian dressing. (No pizza sauce). 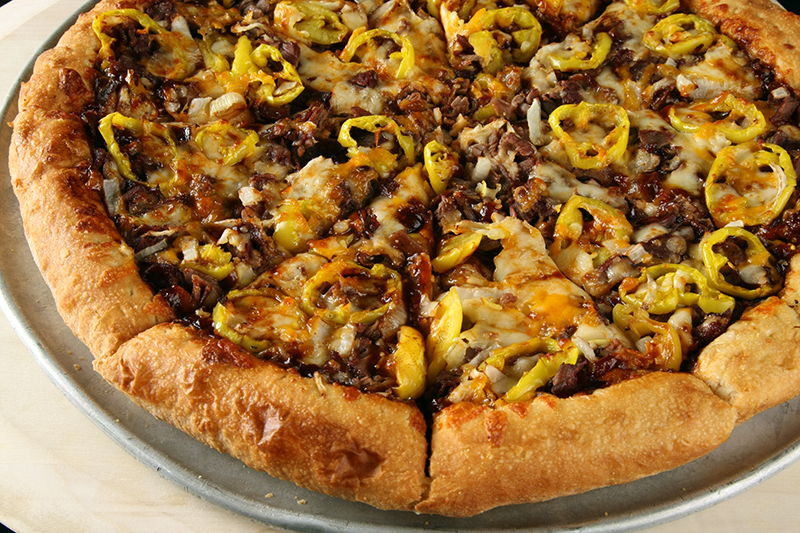 Sliced Roast Beef, onions, banana peppers, cheddar cheese and BBQ Sauce (No tomato sauce). 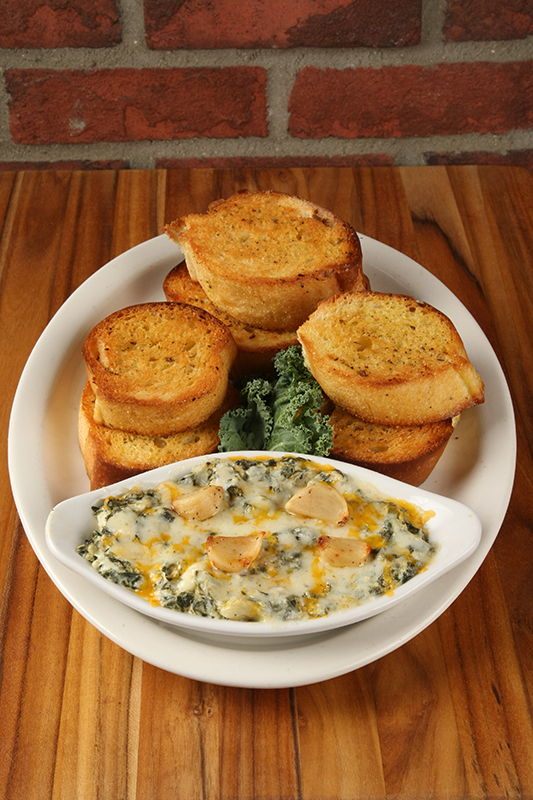 Fresh spinach, artichoke heart dip, diced tomato bruschetta topped with mozzarella. (No pizza sauce). 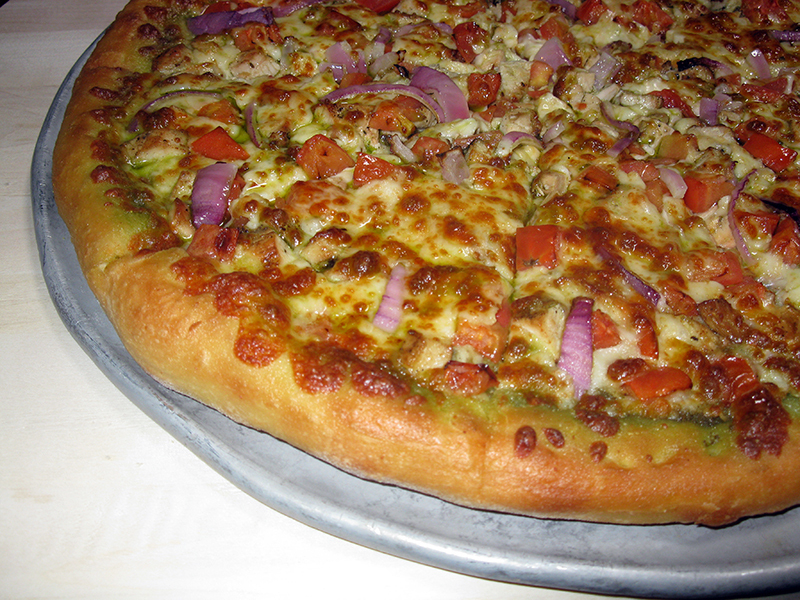 Chicken breast, tomato, red onion, and homemade pesto sauce. No pizza sauce. 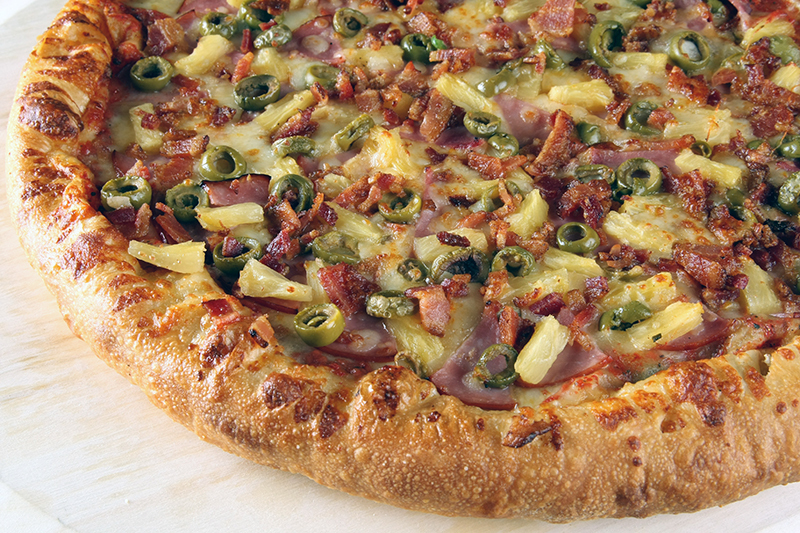 Ham, pineapple, bacon, and extra mozzarella. Thin crust pizza with fresh mozzarella slices, tomato slices, fresh basil & oregano. 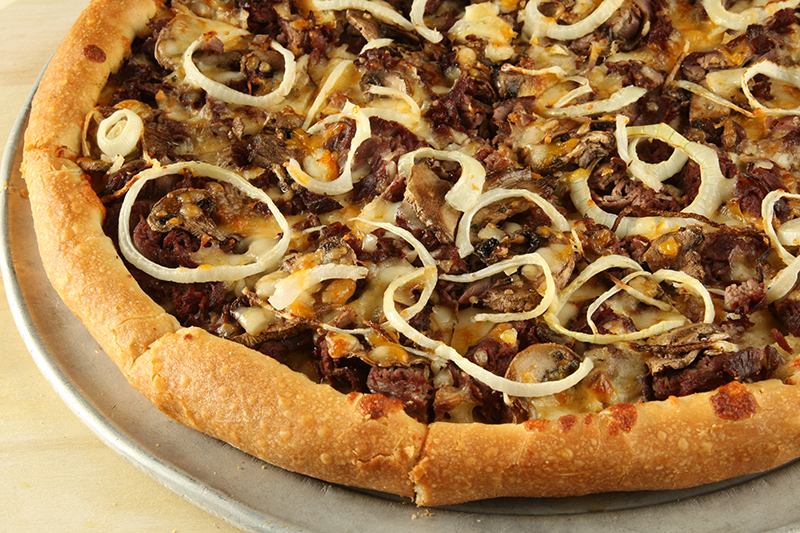 Sliced roast beef, onions, mushrooms, mozzarella, cheddar & garlic butter sauce. (No pizza sauce). 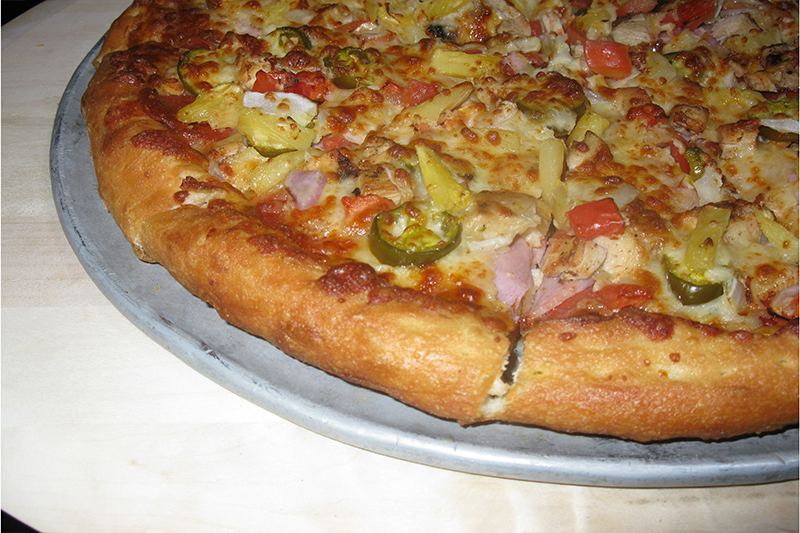 Chorizo, ham, chicken breast, pineapple, jalapeños, tomato and onion. 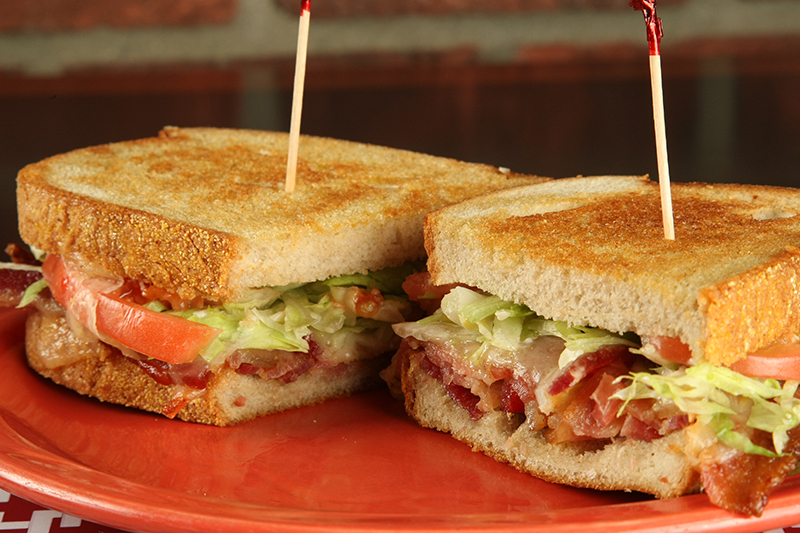 Chicken breast, bacon, lettuce, tomato and Ranch dressing. No pizza sauce. BBQ sauce, blended mozzarella, chicken, bacon, onions, cheddar cheese. (No pizza sauce). 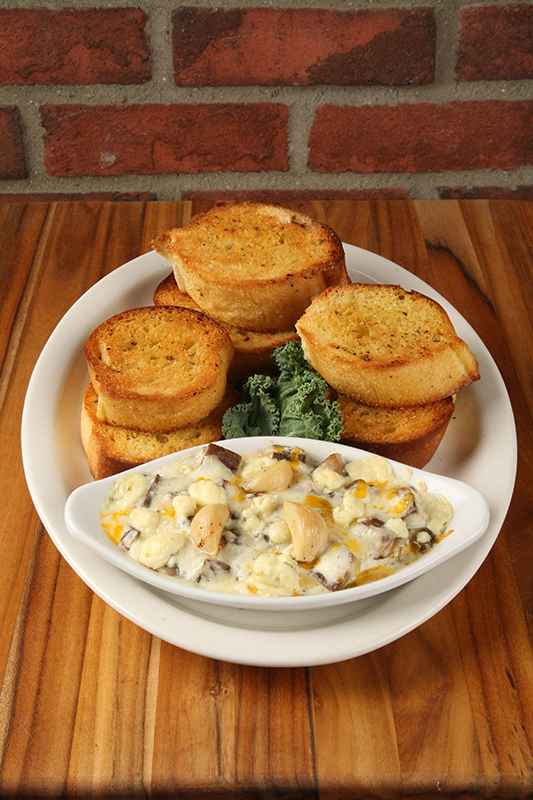 All our pasta dinners include fresh baked garlic bread. Add any of these tasty options to any pasta! A generous portion of spaghetti with marinara and plenty of our famous Italian meatballs! A classic combination. Served with fresh baked garlic bread. Chopped Italian sausage & meatballs, baked in marinara with peppers & onions, topped with mozzarella on a bed of penne pasta. Served with fresh baked garlic bread. Ricotta stuffed shells complimented with your choice of marinara or homemade Alfredo. Served with fresh baked garlic bread. Four cheese ravioli baked in marinara, topped with mozzarella. Served with fresh baked garlic bread. 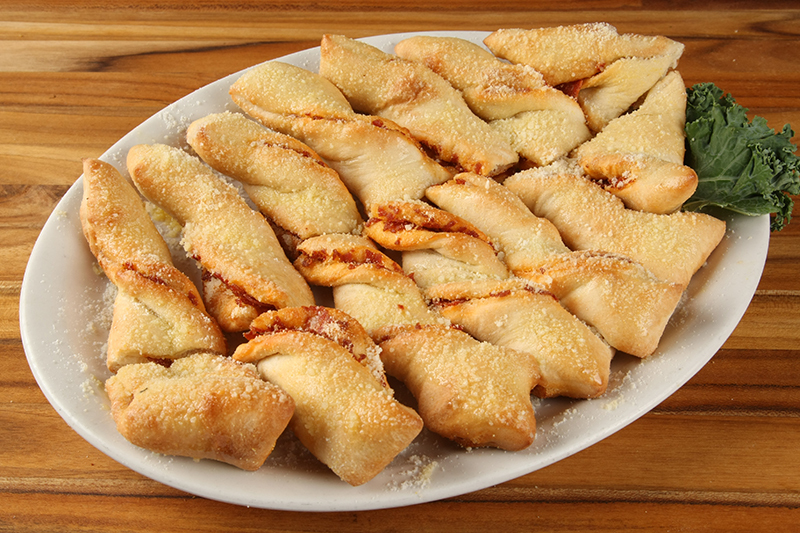 Ricotta cheese filled with rolled pasta, your choice of marinara or alfredo baked with mozzarella. Served with fresh baked garlic bread. This favorite of young & old has macaroni in a velvety cheese sauce topped with plenty of cheddar & mozzarella with fresh baked garlic bread. Our homemade chili served on a bed of spaghetti topped with a generous portion of shredded cheddar, diced onion and sour cream. Served with fresh baked garlic bread. Fettuccine sautéed with plenty of fresh portobello mushrooms, sun-dried tomatoes and our homemade St. Tropez sauce (alfredo & marinara). Served with fresh baked garlic bread. Our same great mac & cheese with ground beef, fresh mushrooms & onions. A very tasty, hearty meal. Served with fresh baked garlic bread. All white meat chicken, lightly breaded, atop a bed of fettuccine, covered with marinara & topped with mozzarella and baked to perfection. Served with fresh baked garlic bread. With marinara or alfredo. Served with fresh baked garlic bread. 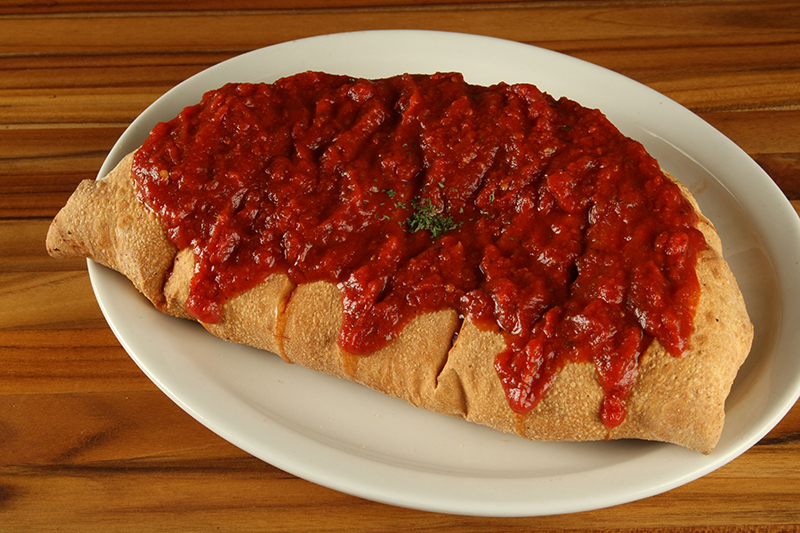 With marinara and mozzarella, baked to perfection. Served with fresh baked garlic bread. Fettuccini with our homemade alfredo! Served with fresh baked garlic bread. Our fettuccine alfredo complimented with fresh broccoli & marinated chicken breast. Served with fresh baked garlic bread. Fettuccine sautéed with plenty of chopped Italian sausage & our homemade alfredo. Served with fresh baked garlic bread. Fettuccini with our homemade pesto sauce, tomatoes, onions and sautéed shrimp. Served with fresh baked garlic bread. Our traditional lasagna with four Italian cheeses and marinara. Served with fresh baked garlic bread. Fresh spinach and four Italian cheeses with homemade Alfredo. Served with fresh baked garlic bread. 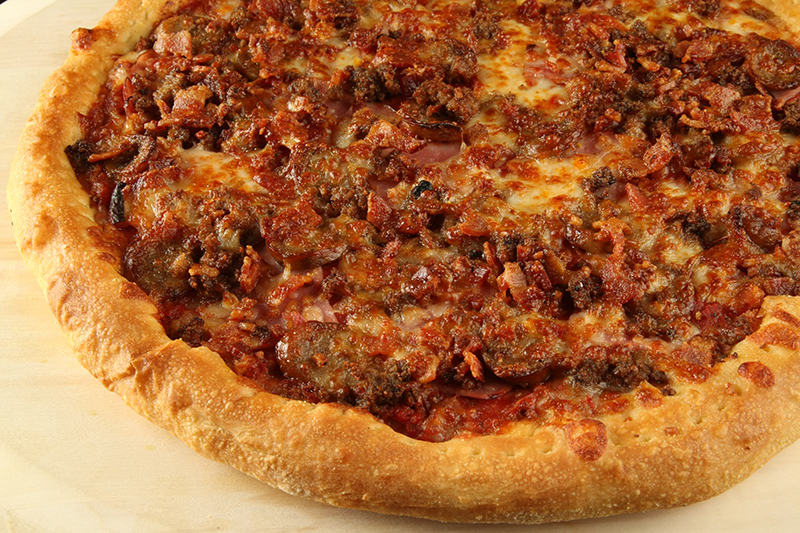 Our traditional lasagna with Italian sausage, sliced pepperoni, ground beef and marinara. Served with fresh baked garlic bread. Our four cheese lasagna baked with plenty of chopped fresh spinach. 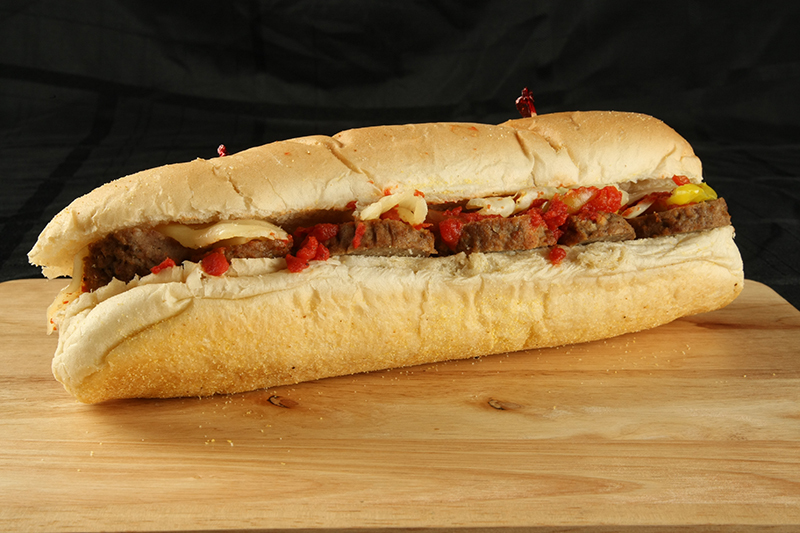 Served with fresh baked garlic bread. Big enough for two! 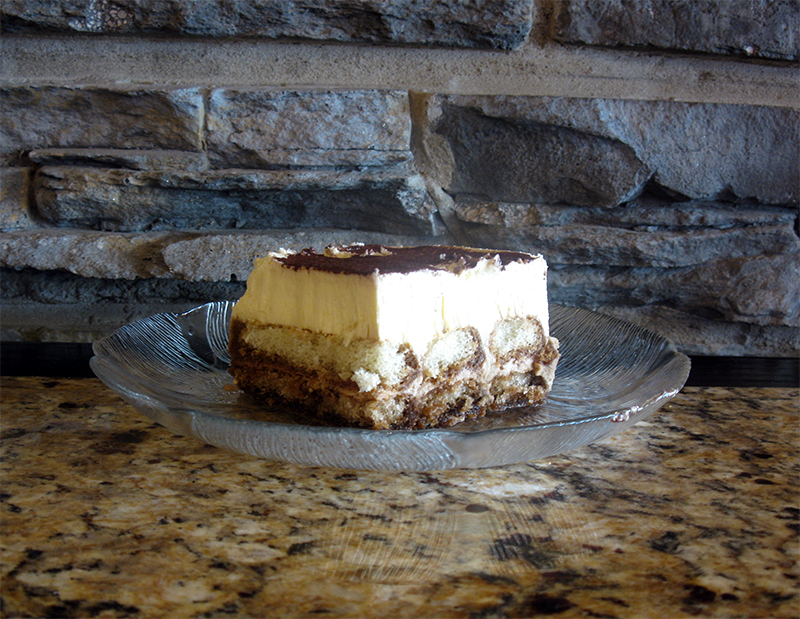 A rich creamy dessert in the traditional New York style with chocolate, caramel or strawberries. 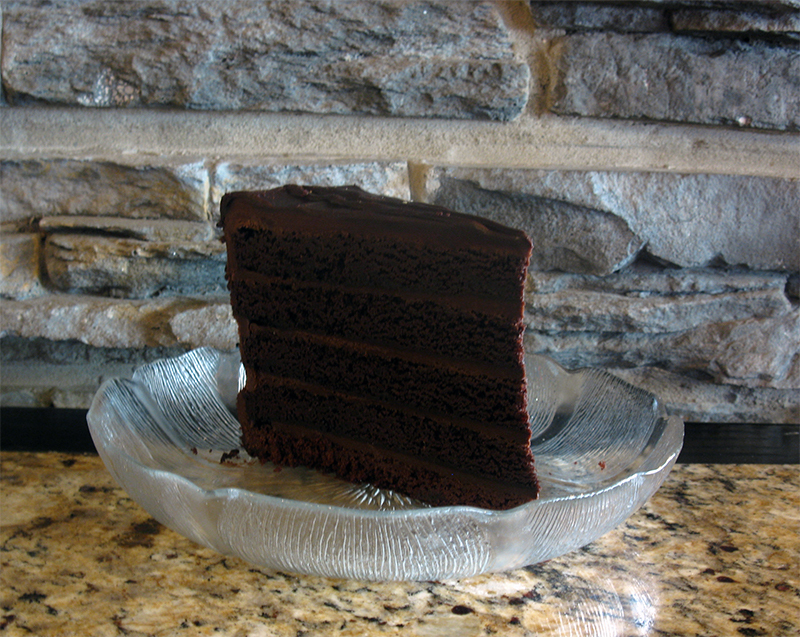 Three layers of rich deep dark chocolate cake slathered with fudge frosting, garnished with lots of chocolate chips. 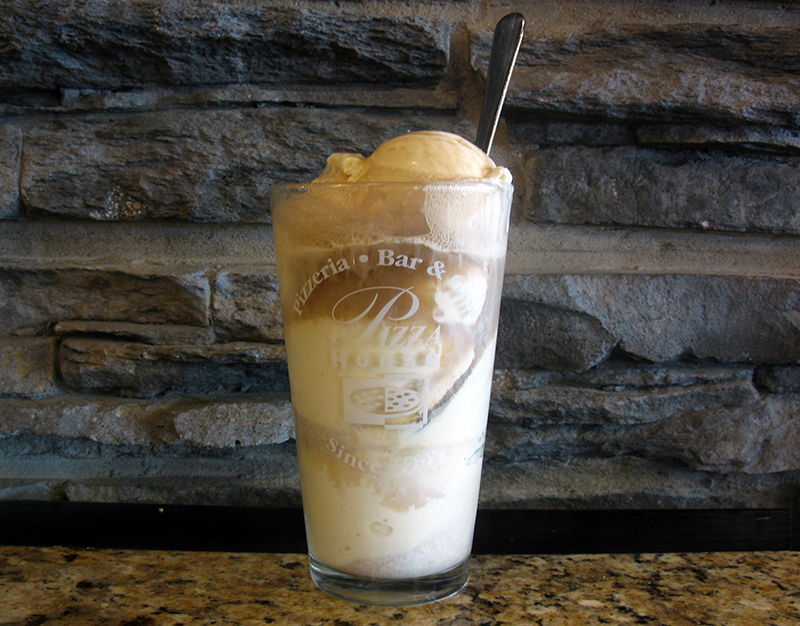 Barq’s root beer poured over premium vanilla ice cream. The very best! 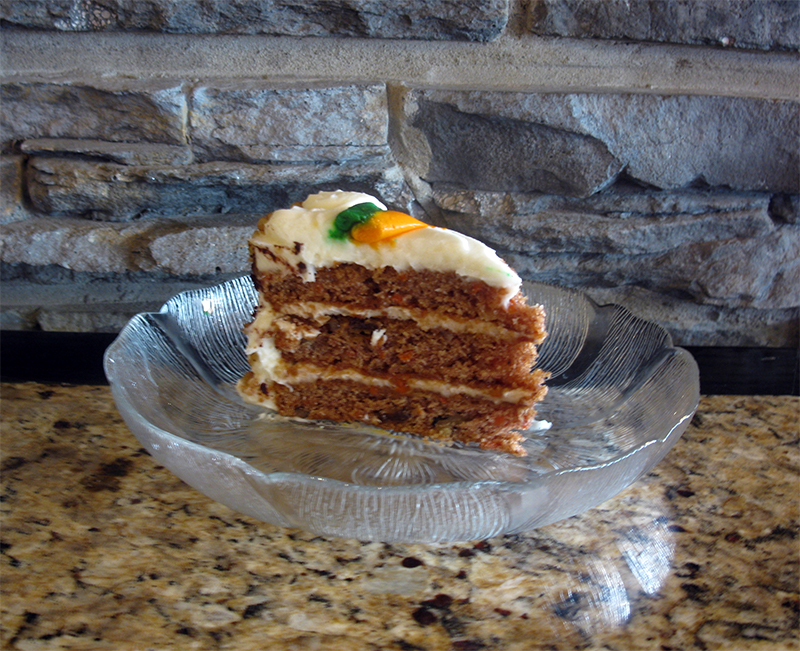 Moist flavorful, this cake incorporates bits of raisins, walnuts, crushed pineapple, cinnamon and grated carrots with a tangy lush cream cheese icing. Delicious! A light Italian custard made with the finest mascarpone cheese and pure whipped cream, surrounding delicate lady fingers soaked in dark espresso and thick coffee liqueur. A coffee-lovers favorite! Your favorite flavors, served in a pint size package! Eat it here or take it home! Start with a generous helping of premium vanilla ice cream topped with creamy hot fudge, whipped cream, Oblaten wafer and of course, a cherry. Three scoops of vanilla ice cream topped with hot apple crisp, lots of caramel, whipped cream and a Oblaten wafer! Three scoops of vanilla ice cream topped with plenty of strawberries, whipped cream and Oblaten wafer. Premium vanilla ice cream, plenty of crushed Oreo’s (no imitations), whipped cream and a Oblaten wafer. An old fashioned chocolate brownie, three scoops premium vanilla ice cream, creamy hot fudge, whipped cream, Oblaten wafer and don’t forget the cherry! Any burger available on a pretzel bun add .99c! 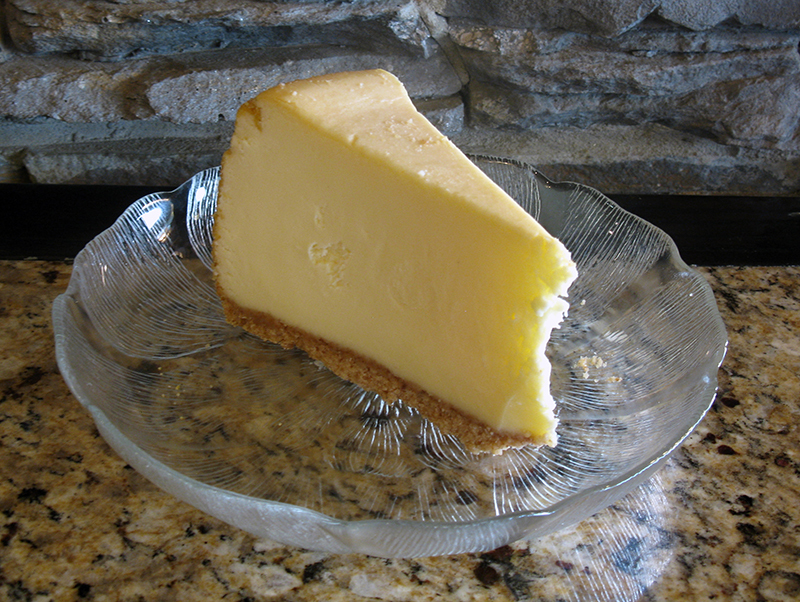 Half pound (8 oz.) Black Angus USDA Choice Ground Beef chargrilled medium well, unless otherwise specified, with choice of two toppics on a fresh brioche bun. Served with choice of fries or one side dish and a pickle spear. 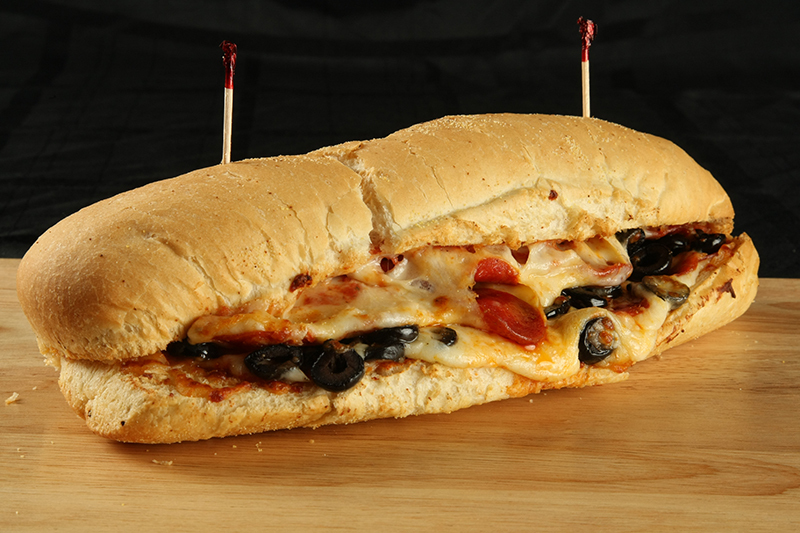 Lettuse & Tomato, American, Cheddar, Mozzarella, Muenster, Feta Cheese, Chorizo, Gorgonzola Cheese, Banana Peppers, Swiss, Bacon, Jalapenos, Green Olives, Black Olives, Sauteed Onions, Garlic, Sauteed Mushrooms, Onions, Pepperoni, Salami, Guacamole. Four mini burgers served with fries and a pickle spear. 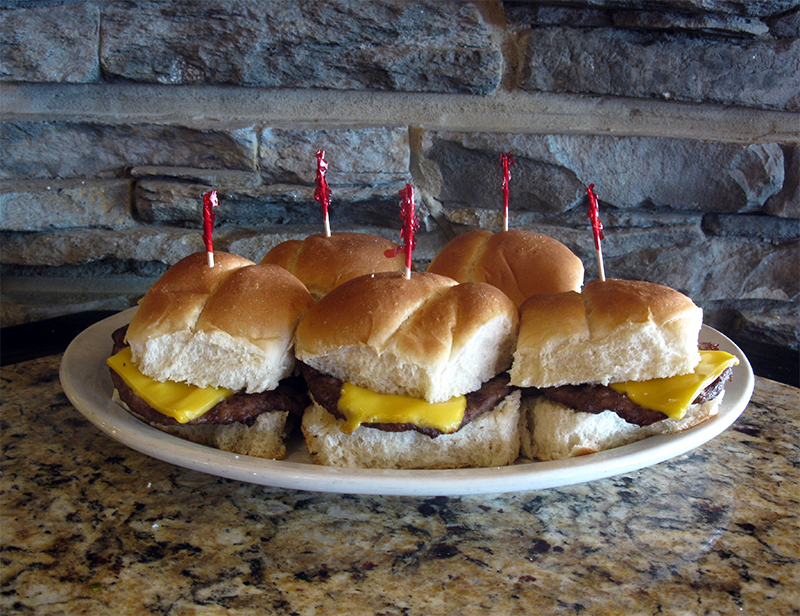 Choice of four… Hickory BBQ, Bacon Cheddar, Black and Bleu or All American Cheeseburger. 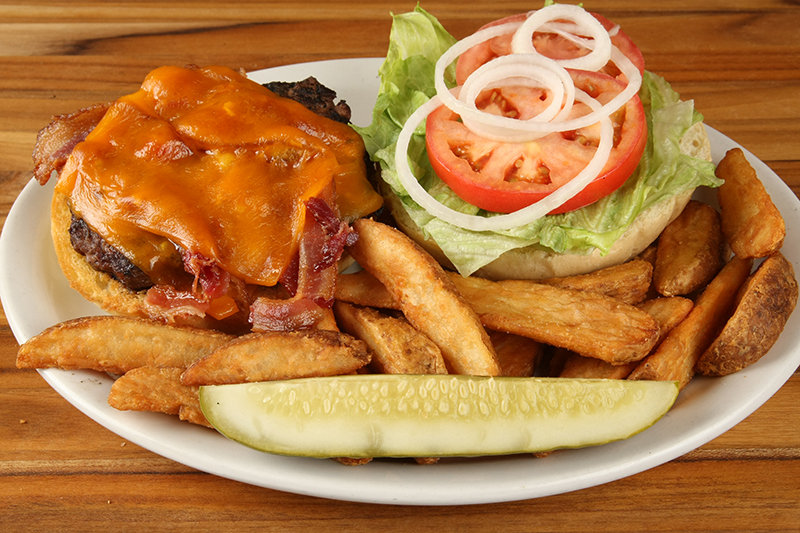 A juicy 1/2 pound burger topped with tangy BBQ sauce, hickory smoked bacon and grilled onions, smothered with plenty of cheddar cheese, lettuce and sliced tomato. Served with steak fries and deli pickle. 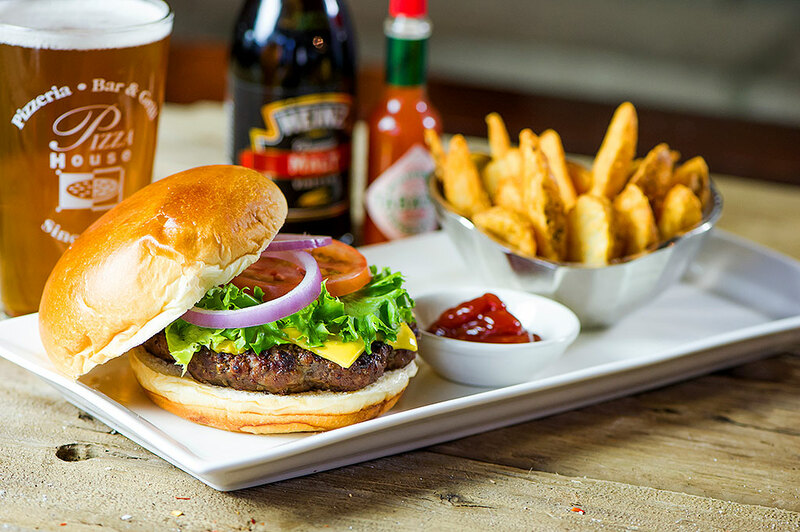 Our famous 1/2 pound burger topped with plenty of smoked bacon and melted cheddar cheese, with lettuce, sliced tomato and onion. Served with steak fries and deli pickle. 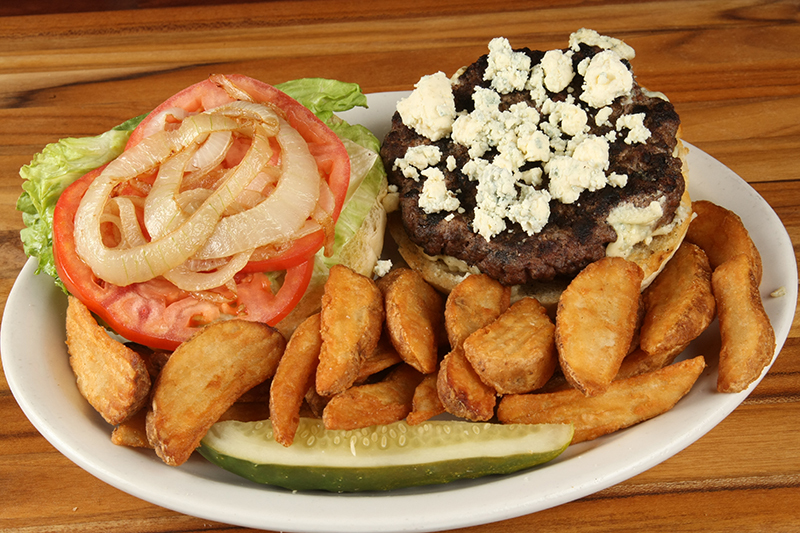 Our 1/2 pound Black Angus burger topped with melted gorgonzola cheese, sautéed onions, lettuce and sliced tomato. Served with fries and a pickle spear. 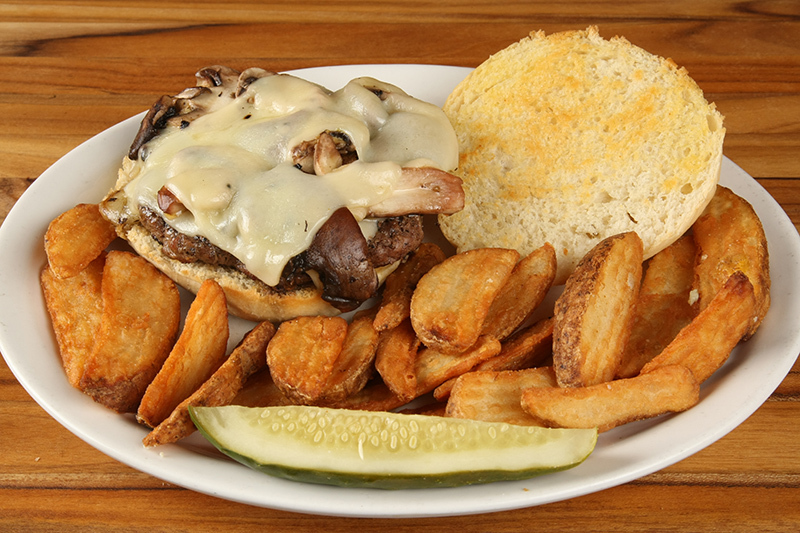 A 1/2 pound burger loaded with fresh sliced mushrooms, and portobello mushrooms, sautéed in garlic butter and topped with melted swiss. 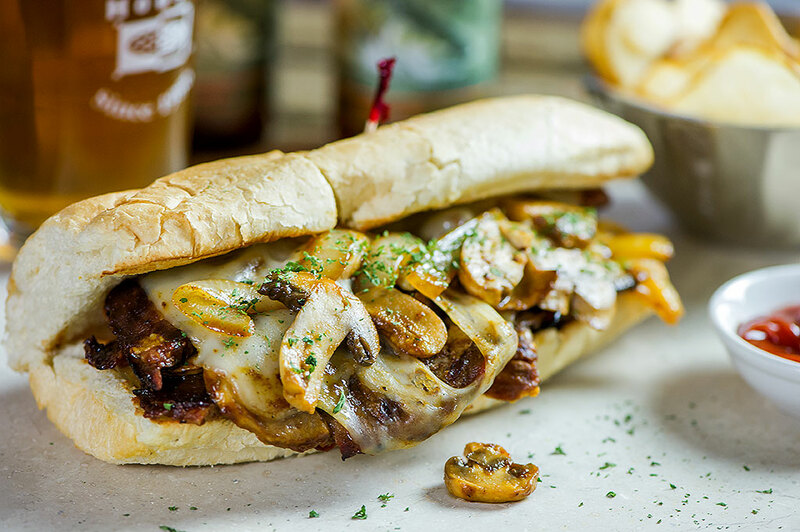 If you love mushrooms, this burger’s for you! Served with steak fries and deli pickle. 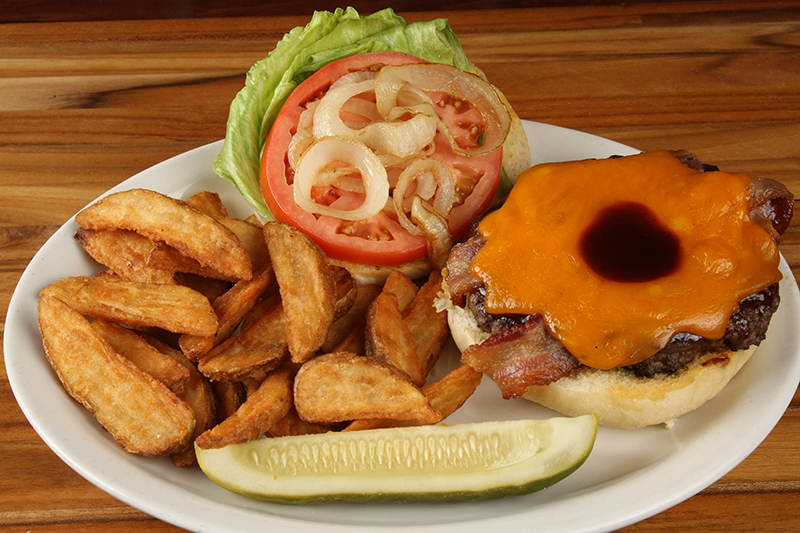 Our juicy 1/2 pound Black Angus burger with melted american cheese and topped with lettuce, sliced tomato and onion. Served with steak fries and deli pickle. 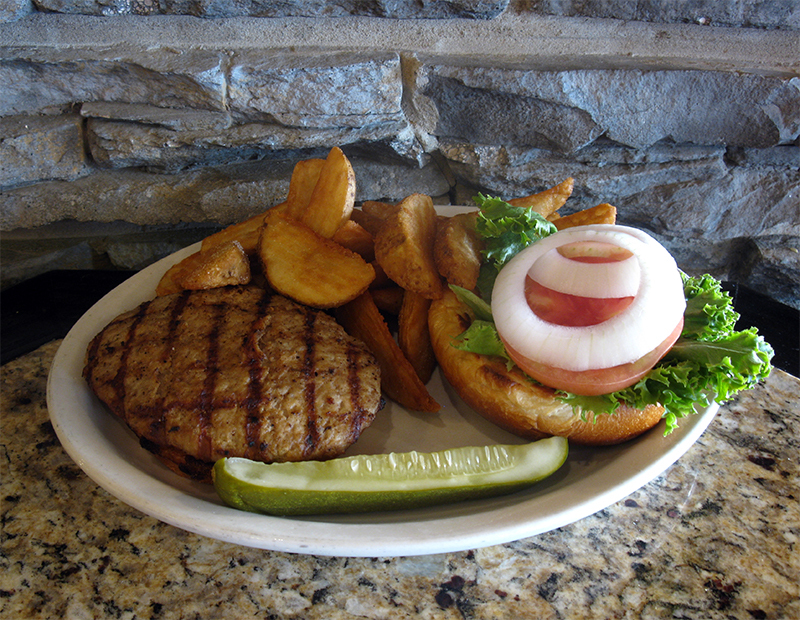 A juicy seasoned turkey burger topped with lettuce, tomato & onion. Served with steak fries and a deli pickle. 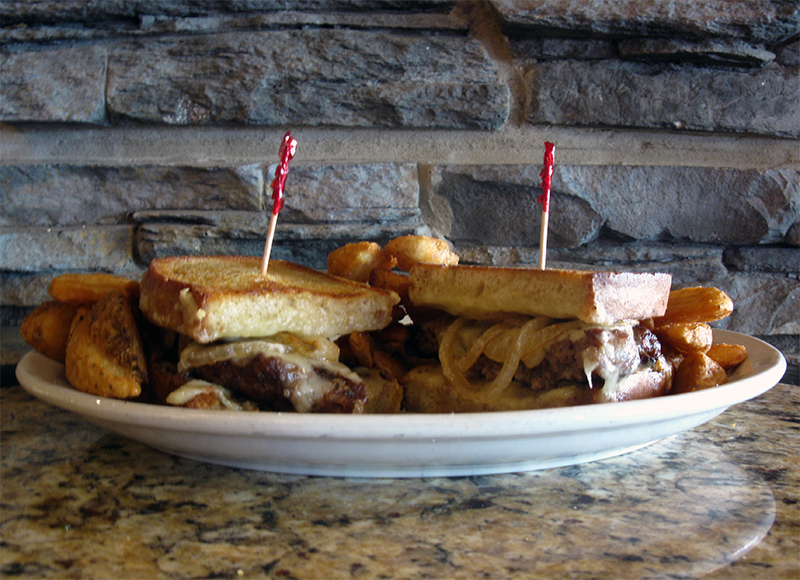 Half pound Black Angus Beef chargrilled medium well topped with swiss cheese and grilled onions, on seedless rye. Served with steak fries. Two Vienna Beef hot dogs topped with coney chili and diced onions. Served with steak fries. Two Vienna Beef hot dogs topped with neon green relish, chopped onions, tomato, pickle spear, sport peppers, yellow mustard and a dash of celery salt. With fries. 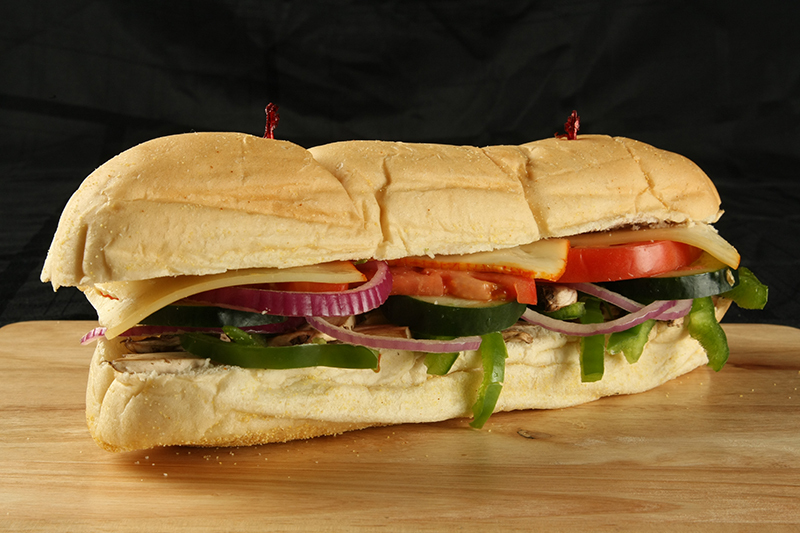 We proudly state we use fresh, never frozen, marinated chicken breasts for all of our chicken sandwiches. Either charbroiled or romano crusted and baked. Tender, grilled BBQ basted chicken breast crowned with crispy bacon and melted cheddar cheese. Served with steak fries and a deli pickle. Tender romano crusted chicken breast tossed in our famous hot sauce baked with grilled onions and melted gorgonzola cheese. 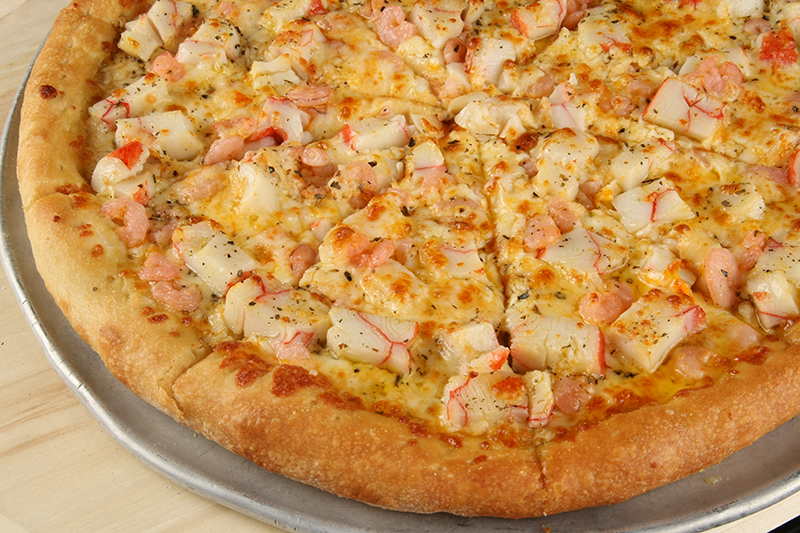 Fresh breast of chicken lightly breaded and sautéed topped with smoked ham and melted mozzarella cheese. Served with steak fries and deli pickle. Our lightly breaded romano chicken breast with grilled portobello mushrooms and sun-dried tomato baked with Mozzarella cheese. Served with steak fries and deli pickle. 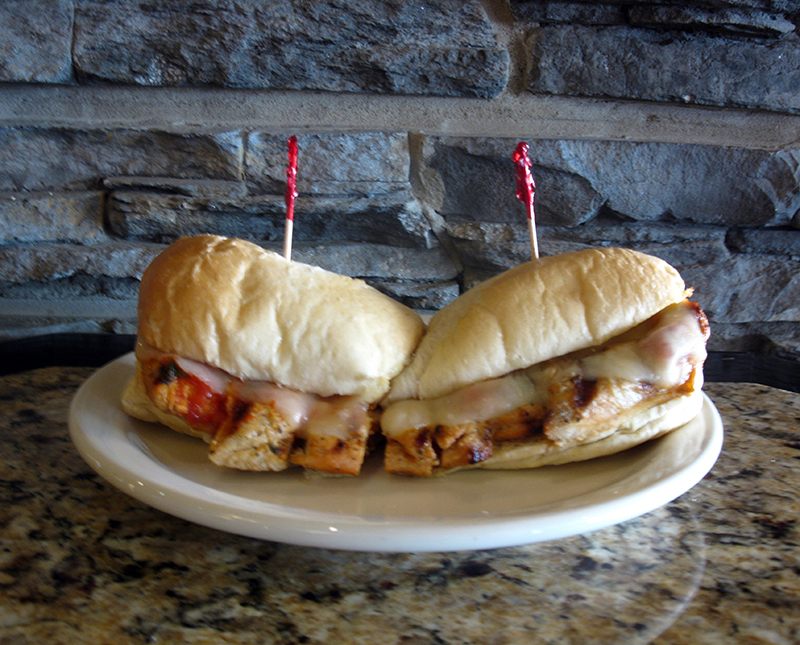 Our tender marinated chicken breast topped with grilled onions, bacon and melted muenster cheese. Marinated lightly breaded Romano chicken breast baked with fresh tomato, crispy bacon and mozzarella cheese topped with our house marinara sauce. Served with steak fries and deli pickle. with Free 32oz Coke or 16oz. Milkshake. 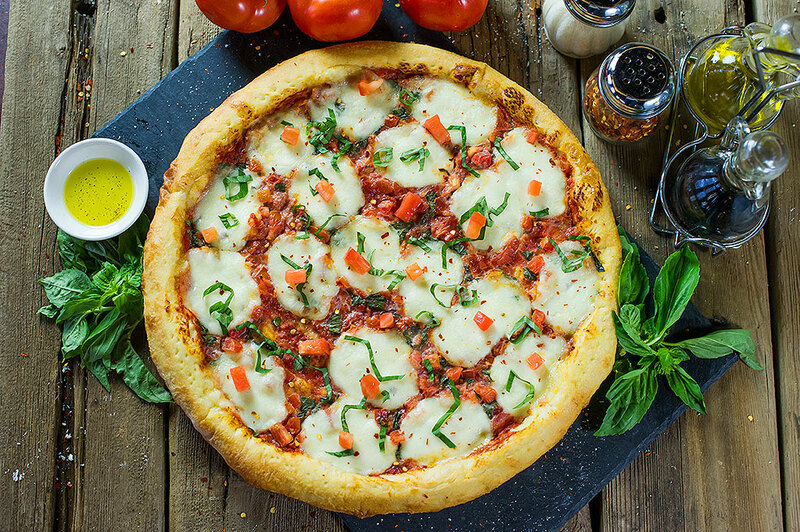 save $12.69 *excludes deep dish. 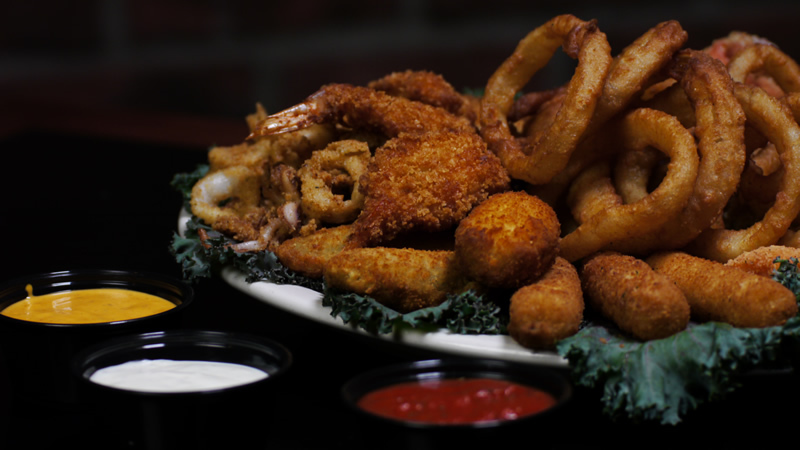 Breaded deep fried shrimp served with our tasty fries or choice of one side dish or coleslaw. 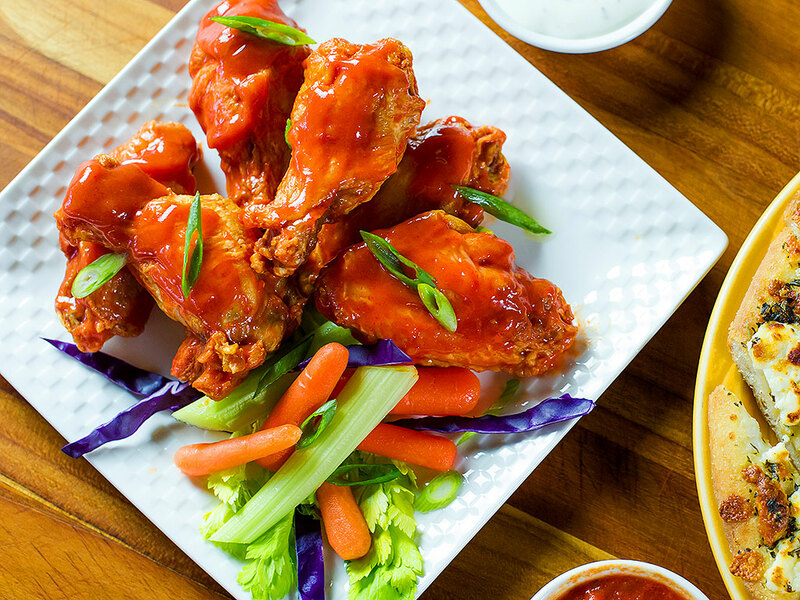 Buffalo style Hot, Spicy Garlic or BBQ Chicken wings, with bleu cheese or ranch for dipping, served with carrots & celery sticks. With steak fries or choice of one side dish. 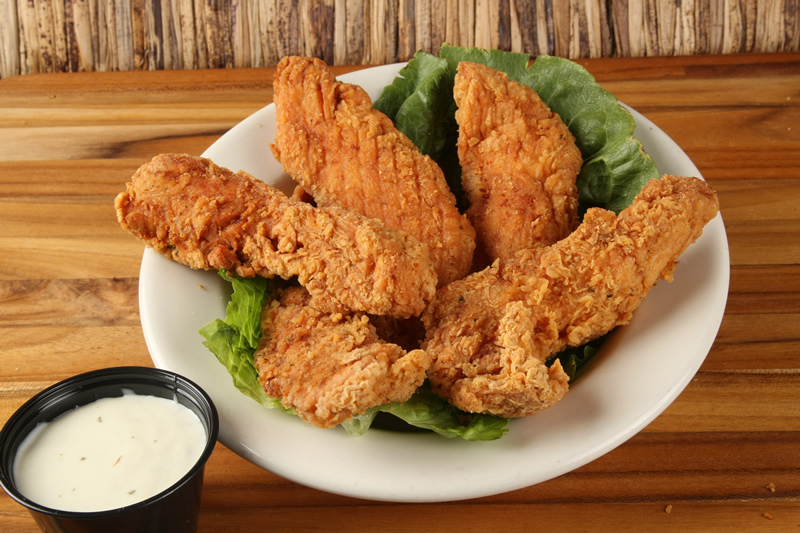 All-white meat chicken, lightly breaded and deep fried to perfection served with our tasty fries or choice of one side dish or coleslaw. 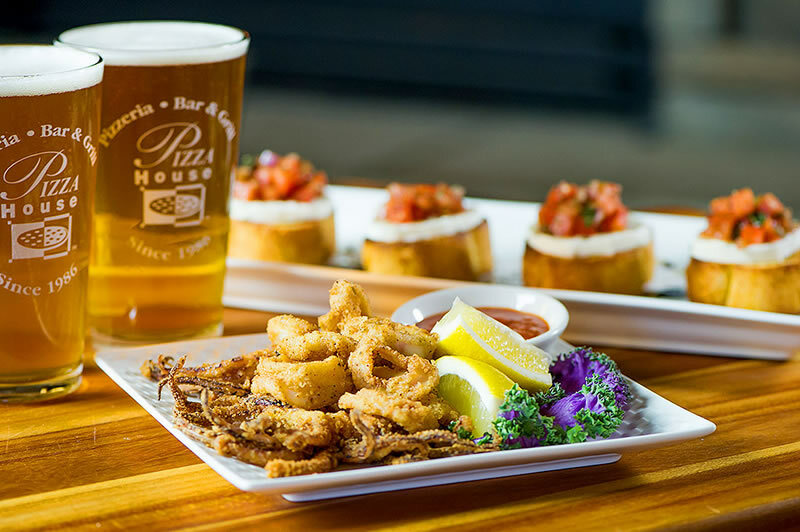 Beer battered Icelandic cod or slightly spiced redfish, deep fried to perfection served with our tasty fries or choice of one side dish or coleslaw. Marinated grilled chicken breast, onions, green peppers and jalapeños surrounded by mozzarella, muenster and cheddar cheeses baked between two flour tortillas. 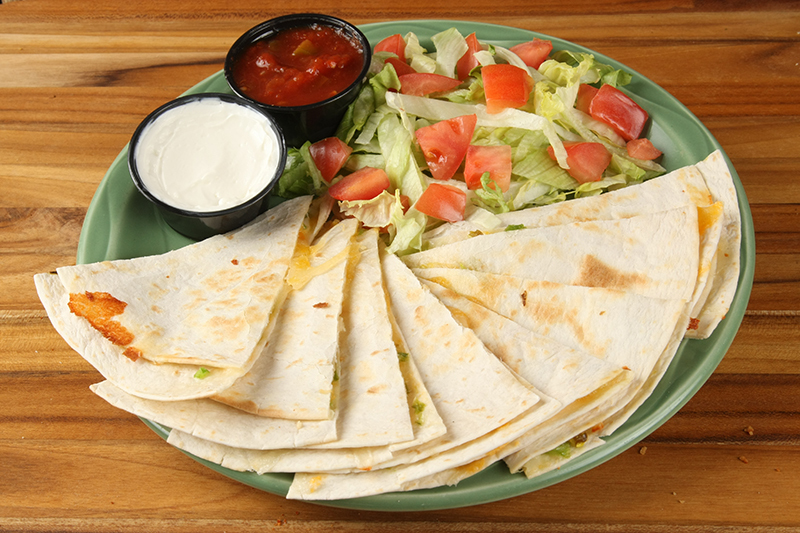 Served with side of salsa and sour cream and choice of one side dish. 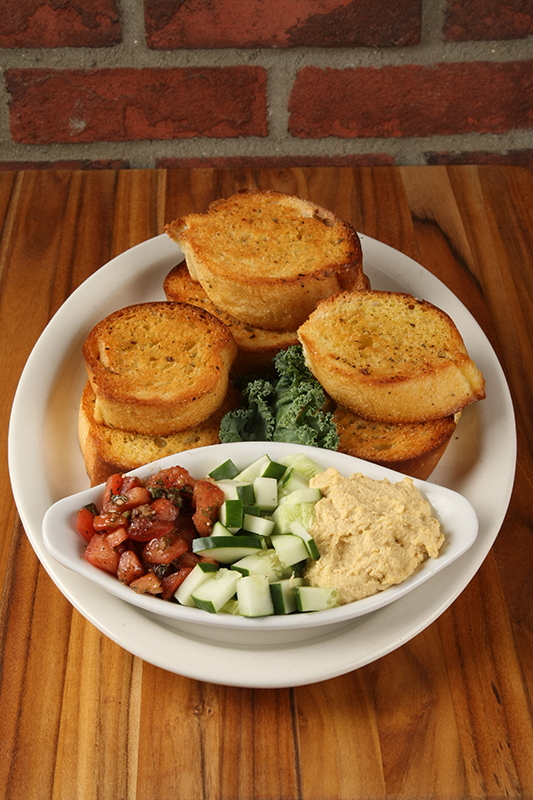 These significant entrees are served with garlic bread, choice of one side dish and a fresh fruit garnish. Enjoy! * Can be cooked to order. Consuming raw or undercooked meats, poultry, seafood, shellfish, or eggs may increase your risk of foodborne illness. Baked Romano Chicken and a delicious slab of ribs. Comes with a side of your choice. 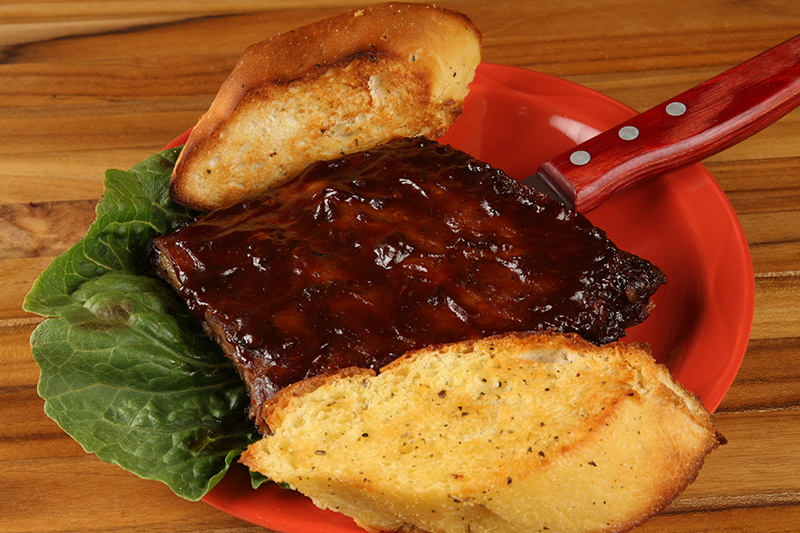 Roll up your sleeves and enjoy our truly delicious ribs. Comes with a side of your choice. Add 7 wings for just $8 more! Lightly breaded sautéed chicken breasts topped with fresh braised spinach, smoked ham, baked with Mozzarella and topped with marinara. Served with garlic bread and a side of your choice. A slab of our tasty ribs with our famous buffalo wings. Comes with a side of your choice. 8 oz. 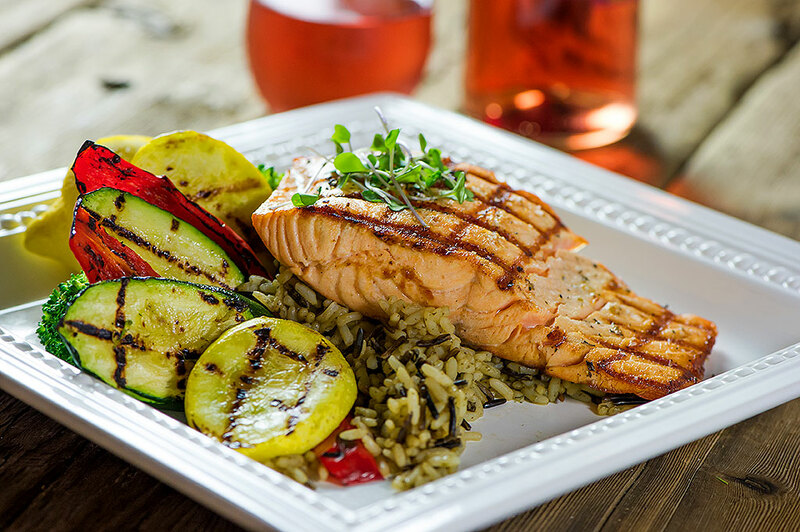 Salmon fillet seasoned and served with sides of wild rice and steamed veggies. 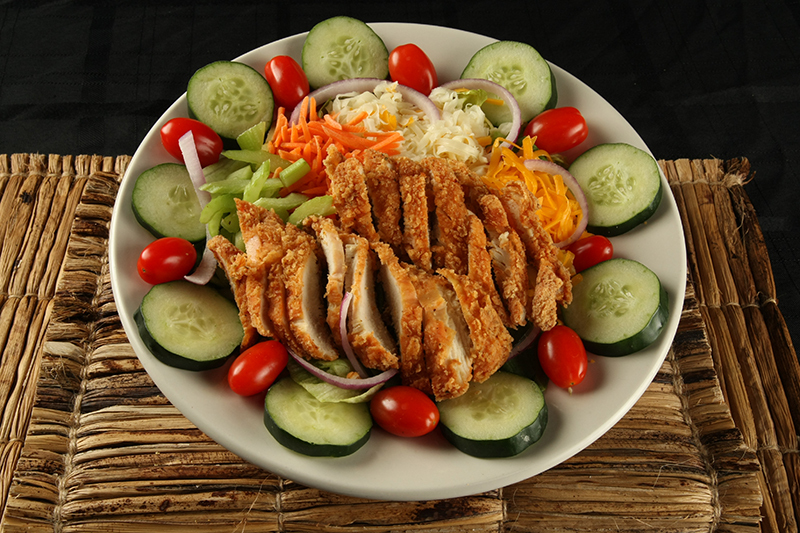 We proudly state we use fresh marinated chicken for all our entrees. 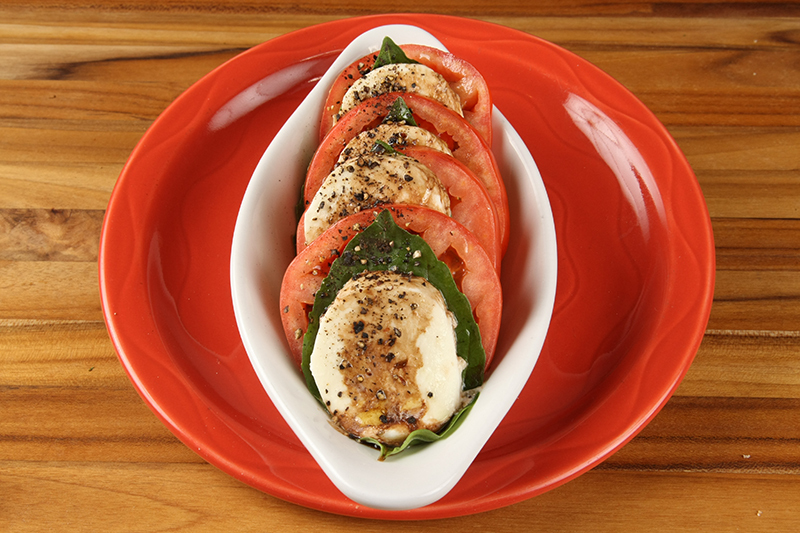 Chargrilled or Romano crusted & baked. 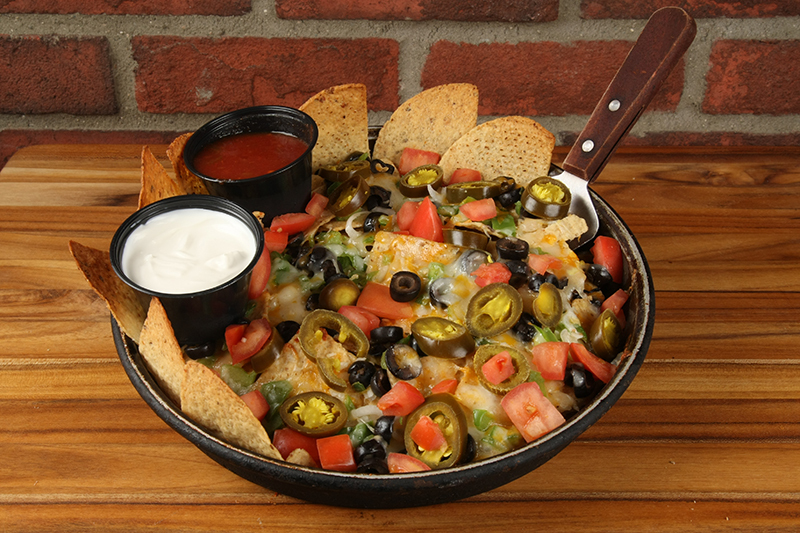 Served with choice of side dish and a fresh fruit garnish ENJOY! Crispy Romano chicken with sweet roasted garlic cloves served with garlic bread and side of your choice. Sautéed romano breaded chicken breasts smothered with assorted mushrooms and melted Swiss cheese. Served with garlic and a side of your choice. Our tender marinated chicken breast charbroiled to perfection and basted with our delicious BBQ sauce topped with smoked bacon and grilled onions. Served with garlic and a side of your choice. Romano crusted chicken breast topped with sliced Portobello mushrooms baked in Alfredo sauce with Romano, bleu and Mozzarella cheeses. Served with garlic bread and a side of your choice. Submarines, Grinders, Heroes... whatever you prefer to call 'em we've got 'em! 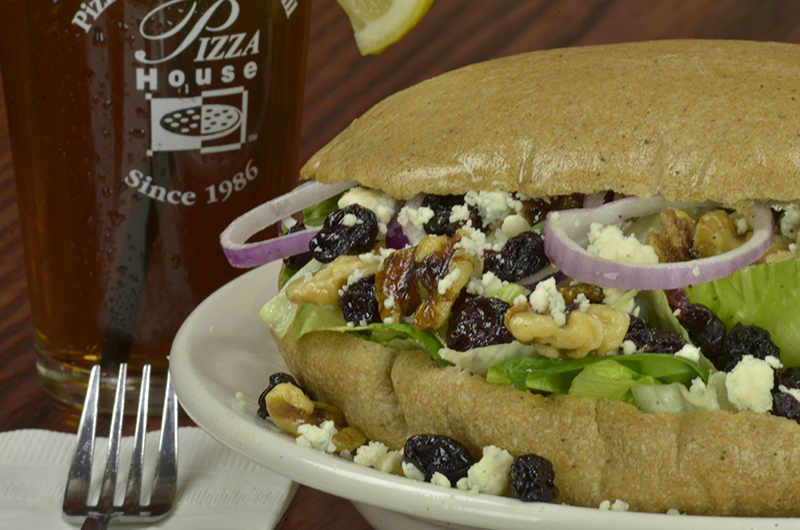 All sandwiches available in white or whole wheat wraps! 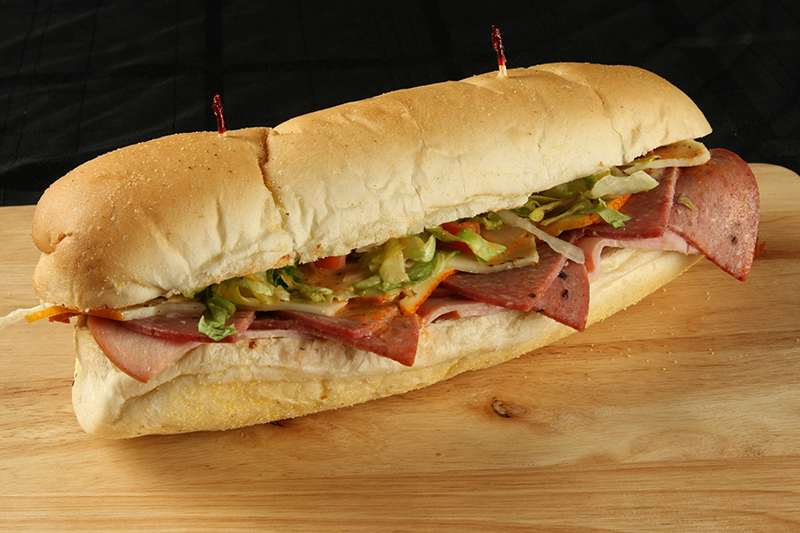 Ham, hard salami, cooked salami, mozzarella and muenster cheese, lettuce, onions, banana peppers, tomato & italian dressing. 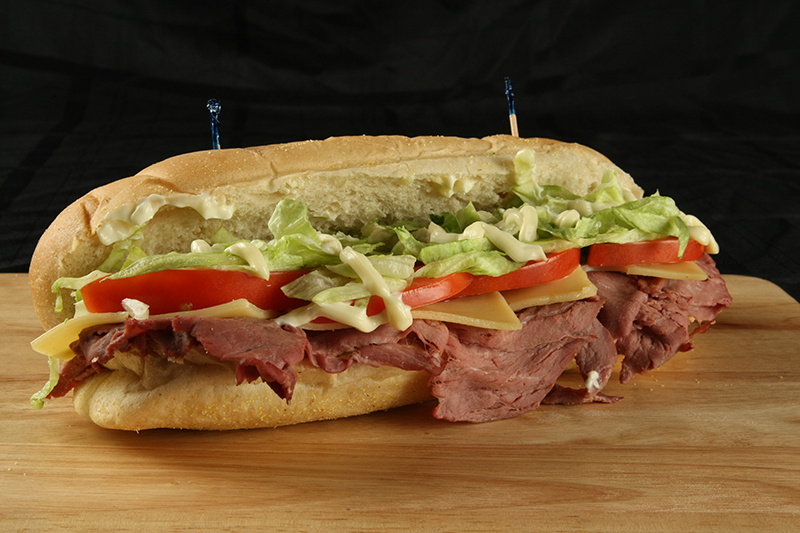 Roast beef, Swiss cheese, lettuce, tomato & mayo. 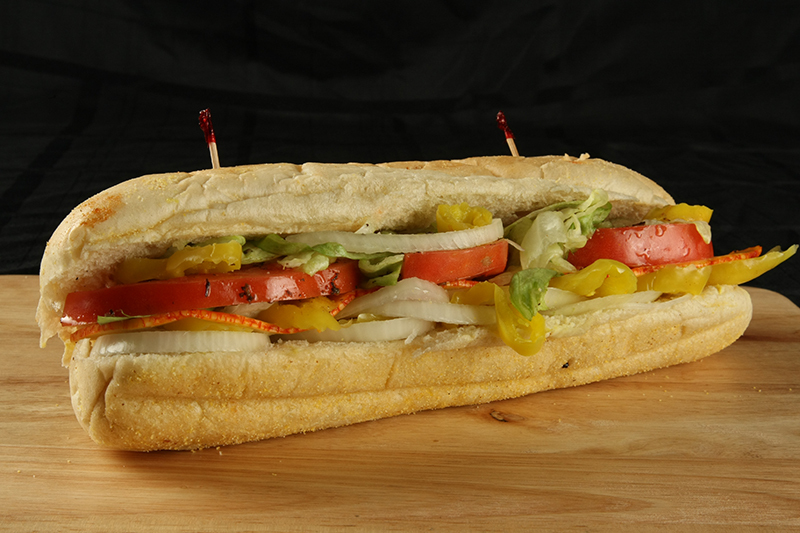 Onions, hot banana peppers, mozzarella & muenster, lettuce, tomato and Italian dressing. 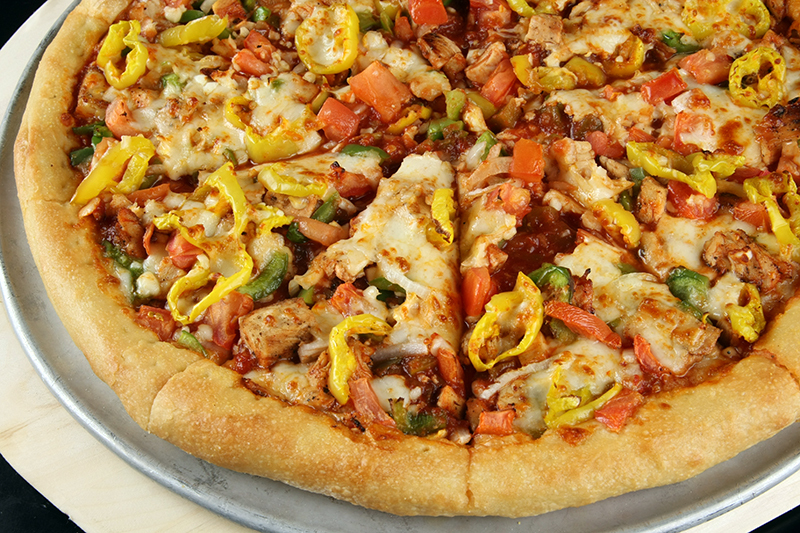 Chopped Italian sausage, green peppers, hot banana peppers, onions and mozzarella, baked in the oven. 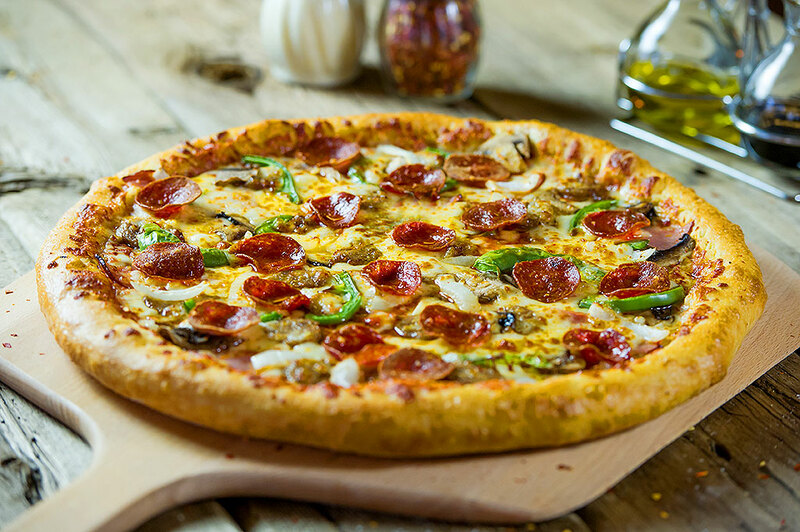 Blended cheese, sauce and choice of any two pizza toppings. 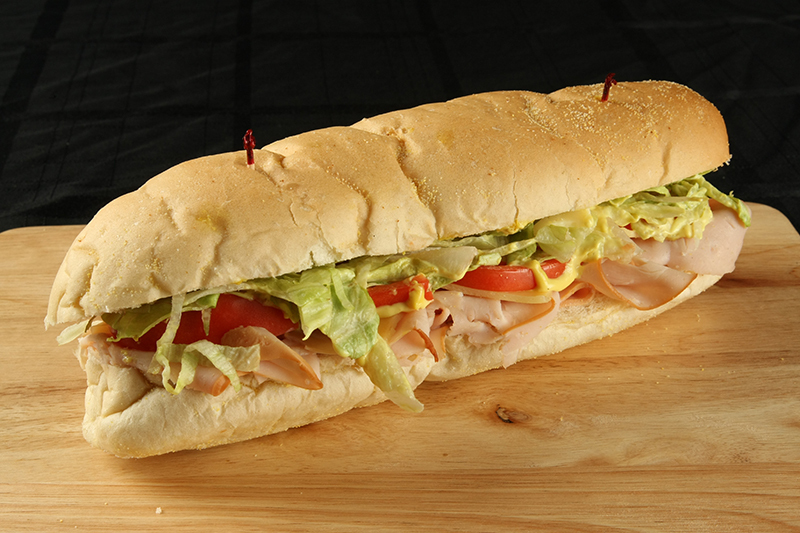 Turkey breast, Swiss, sub sauce, lettuce and tomato. Chopped steak, onions & mushrooms topped with American cheese. Ham, hard salami, cooked salami, mozzarella and muenster cheese, onions, lettuce, tomato, Italian dressing and hot sauce. Steak, mushrooms, mozzarella cheese, onions and steak sauce. 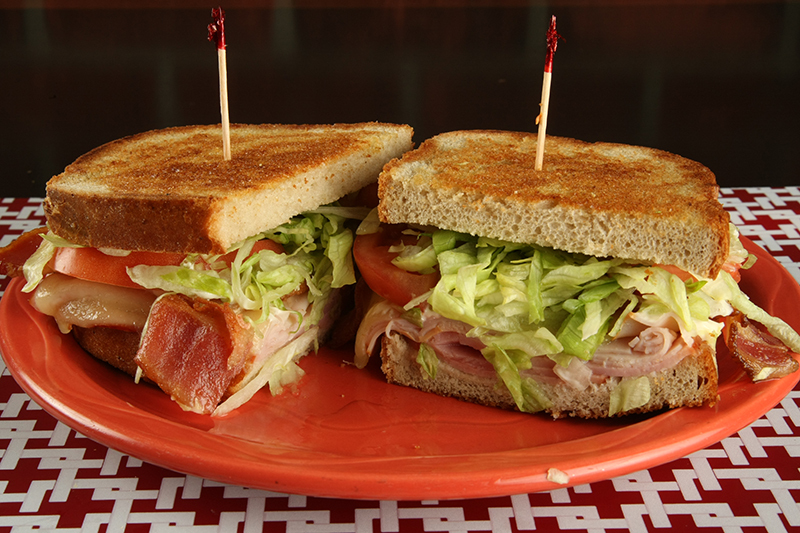 Turkey breast, ham, bacon, Swiss, lettuce, tomato and mayo. Meatballs, mozzarella cheese, onions, banana peppers, marinara sauce, baked in the oven. 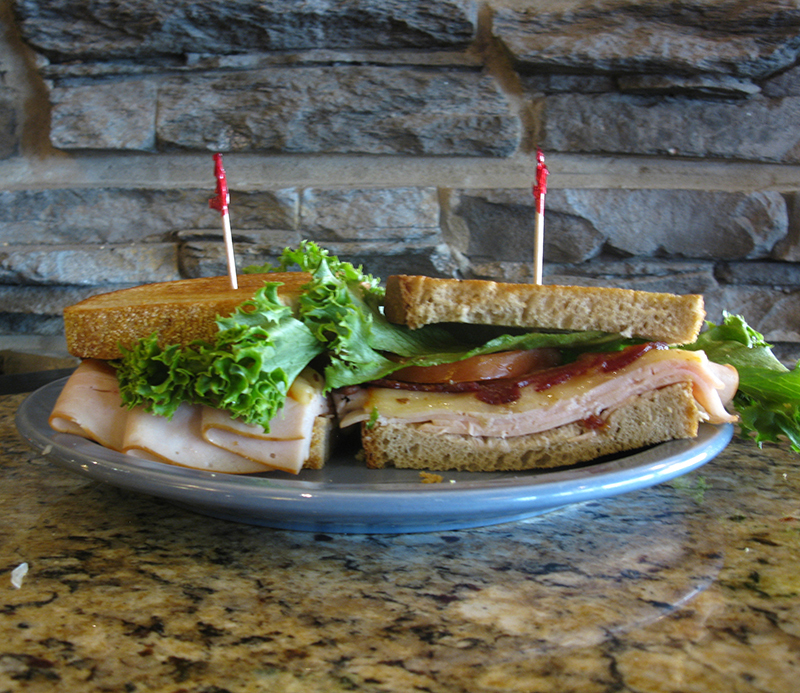 Turkey breast, bacon, muenster cheese, guacamole, lettuce and tomato. 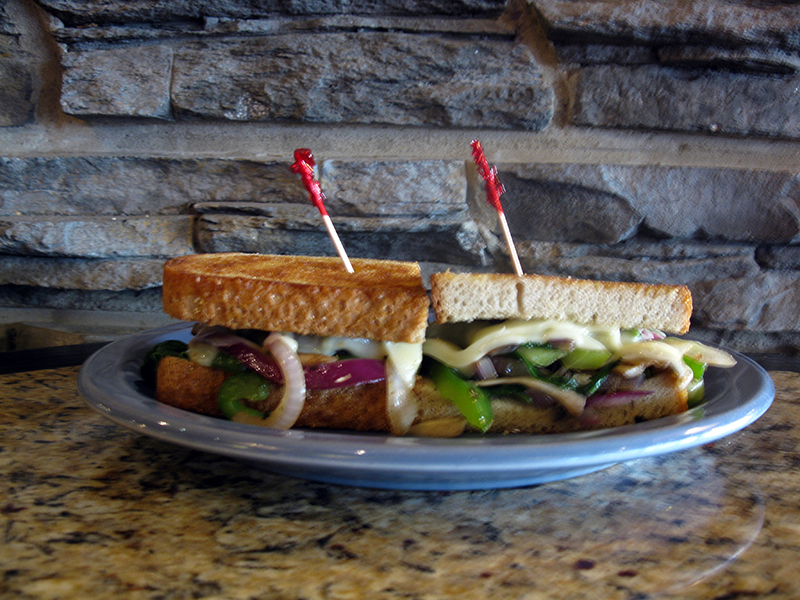 Green peppers, mushrooms, red onions, cucumbers, muenster cheese, tomato and ranch dressing. 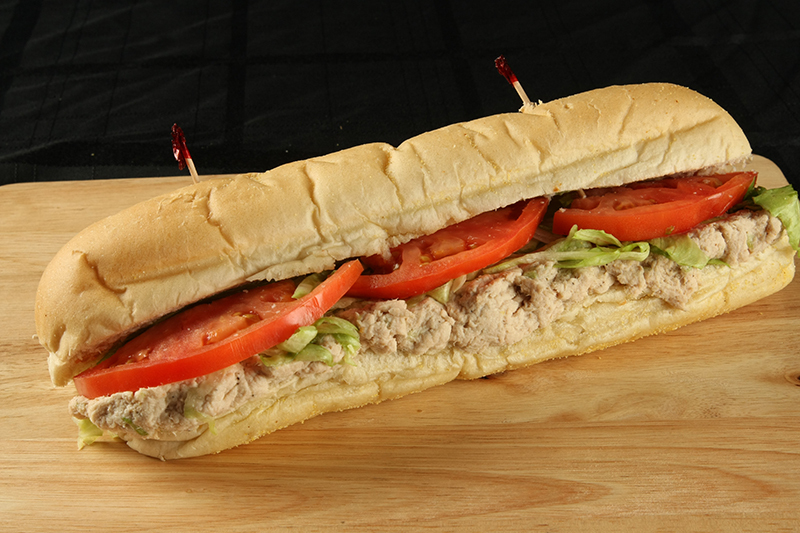 Tuna salad, baked in the oven topped with lettuce and tomato. Grilled chicken breast topped with mozzarella cheese and marinara sauce, baked in the oven. 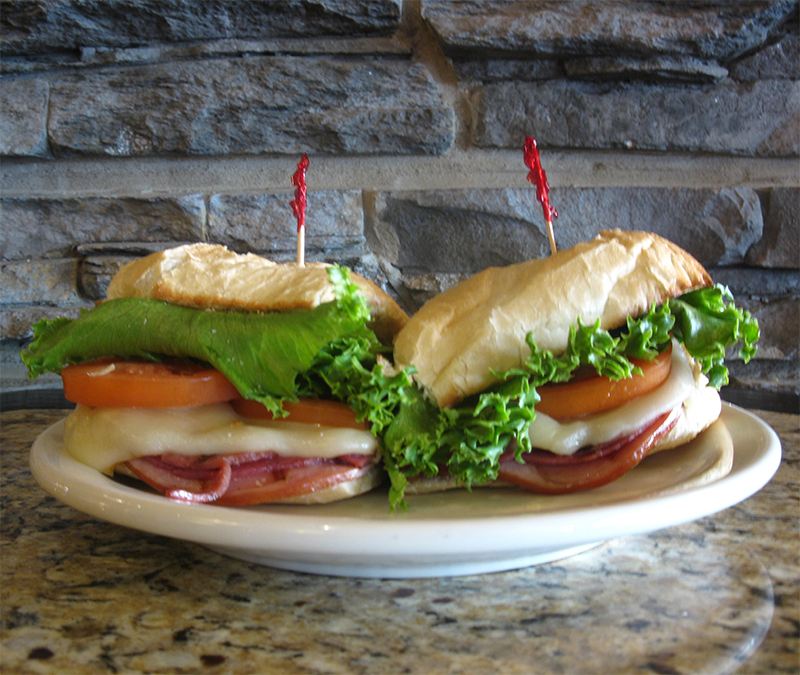 Ham, American cheese, lettuce, tomato and mayonnaise. 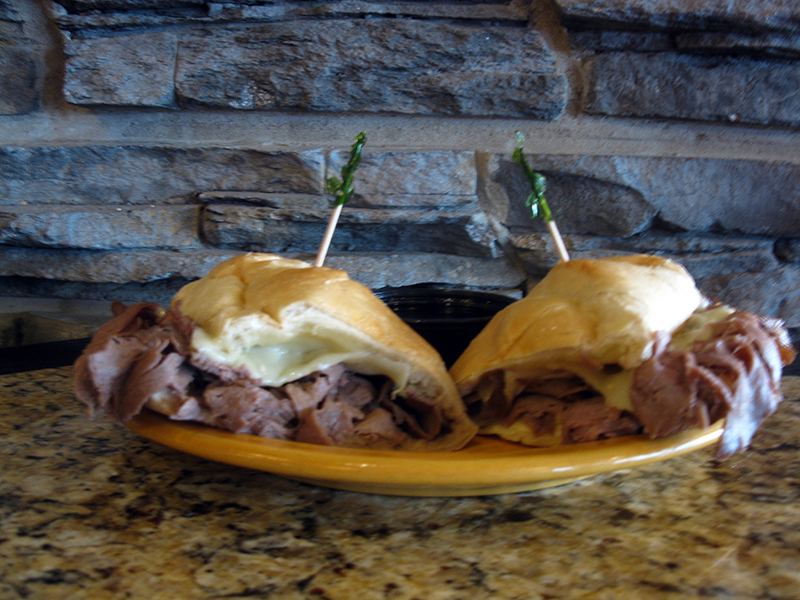 Thinly sliced Roast Beef topped with Swiss & baked on an 8″ Italian Loaf. Served with a side of Au Jus and a side of steak fries. 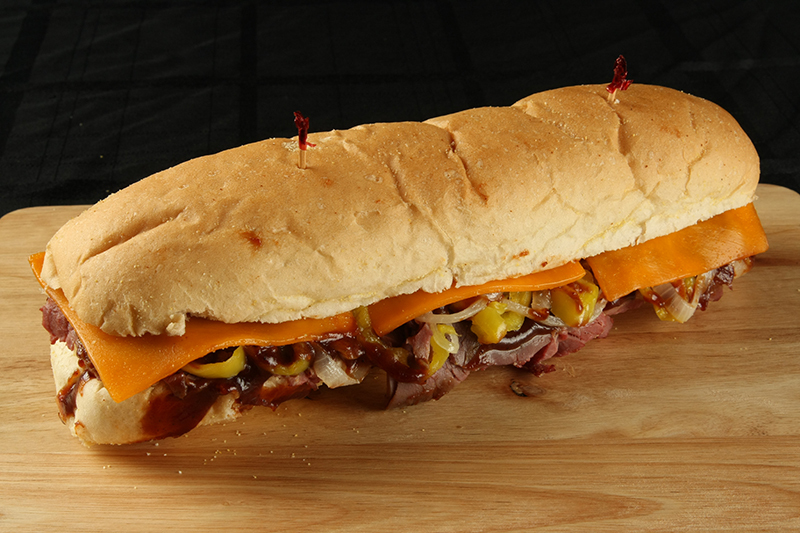 Thinly sliced roast beef chopped with onions & banana peppers topped with cheddar cheese & BBQ sauce. Ok, so we don’t have a “deli” in back. 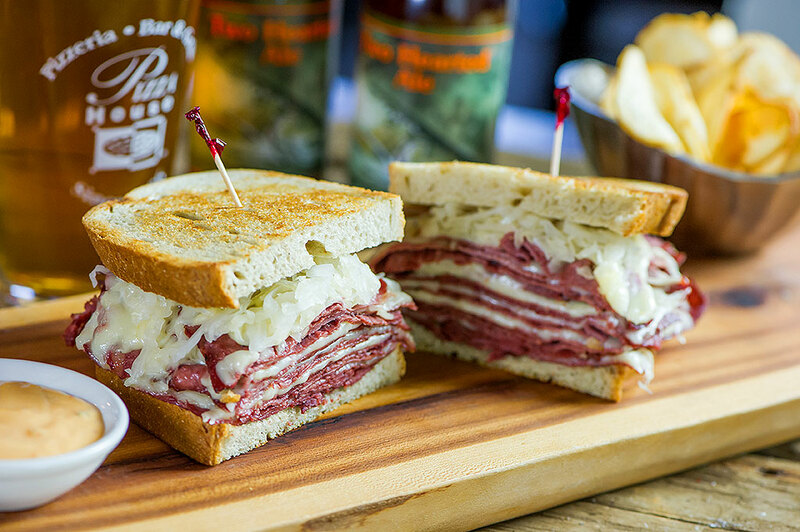 But we sure know how to make a great grilled deli sandwich! 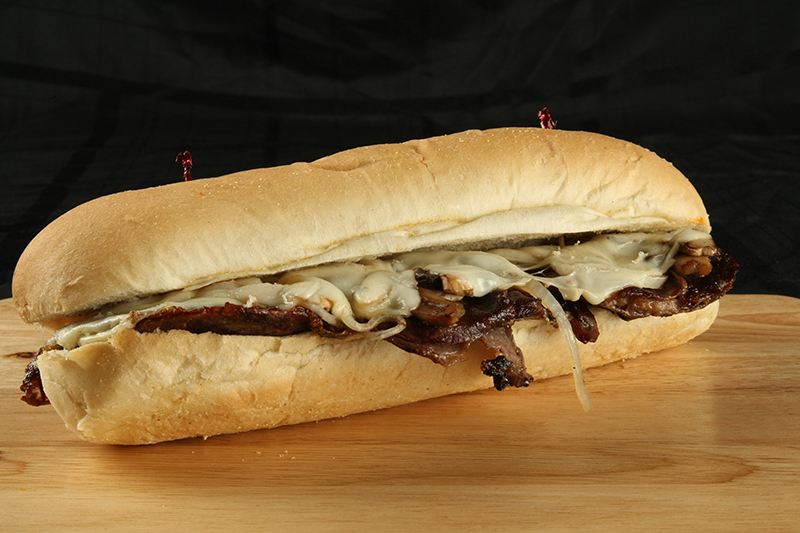 Meat sliced fresh daily then grilled on deli rye, served with your choice of steak fries, onion rings or a bag of chips. 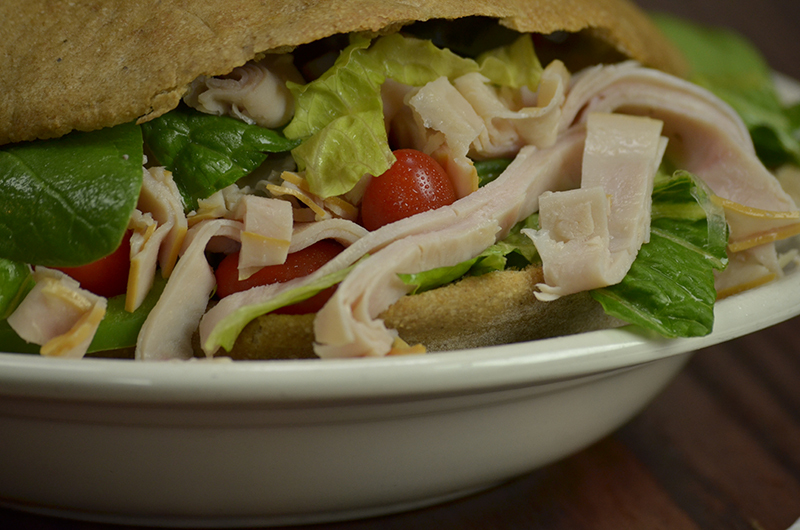 All sandwiches available in white or whole wheat wraps. 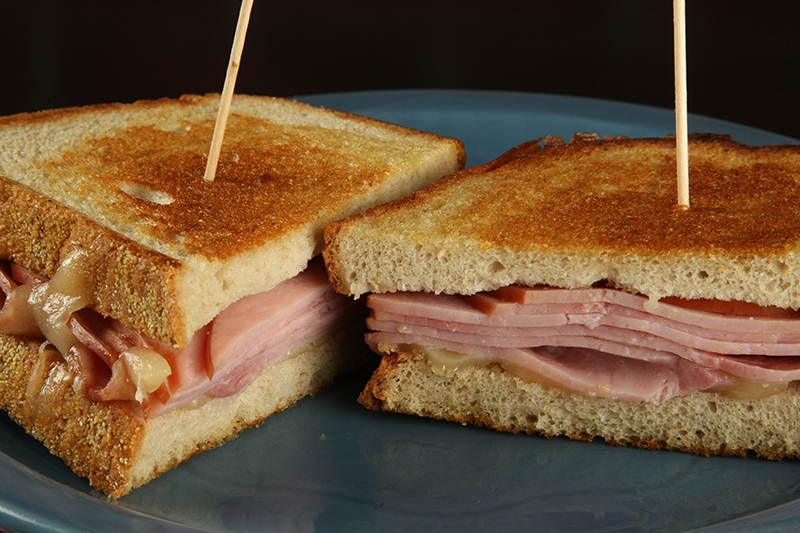 Sliced ham topped with swiss cheese. 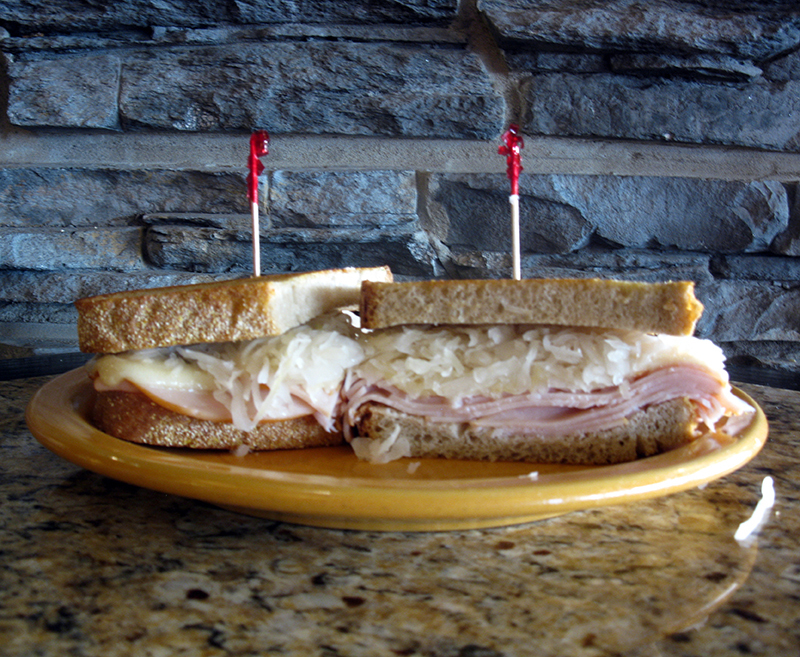 Turkey breast, swiss cheese, sauerkraut, and thousand island dressing. 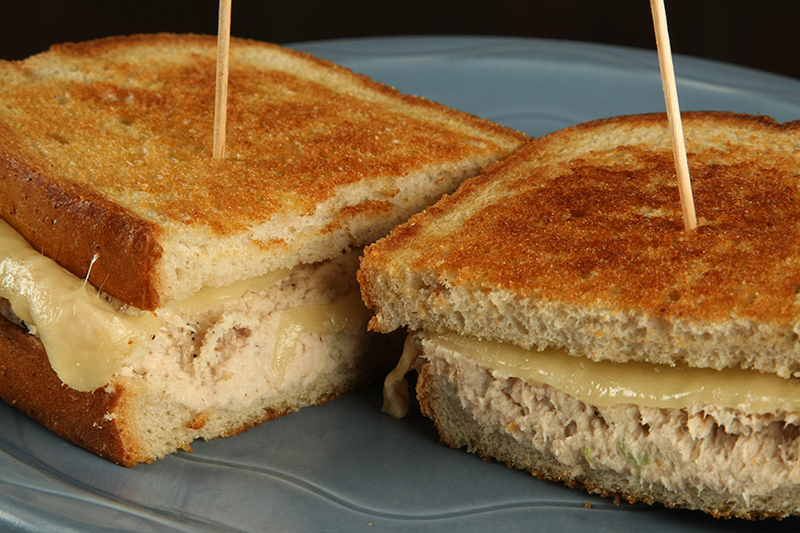 Tuna salad and swiss cheese. 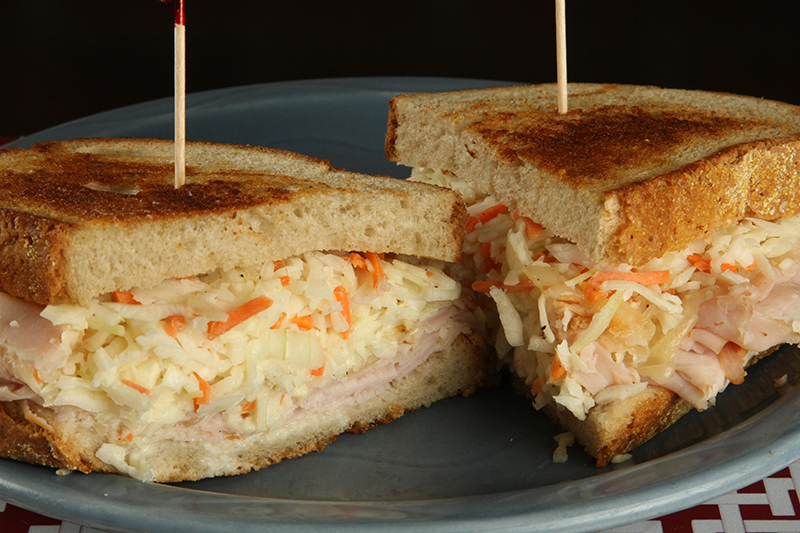 Sliced turkey breast, swiss cheese and homemade coleslaw. 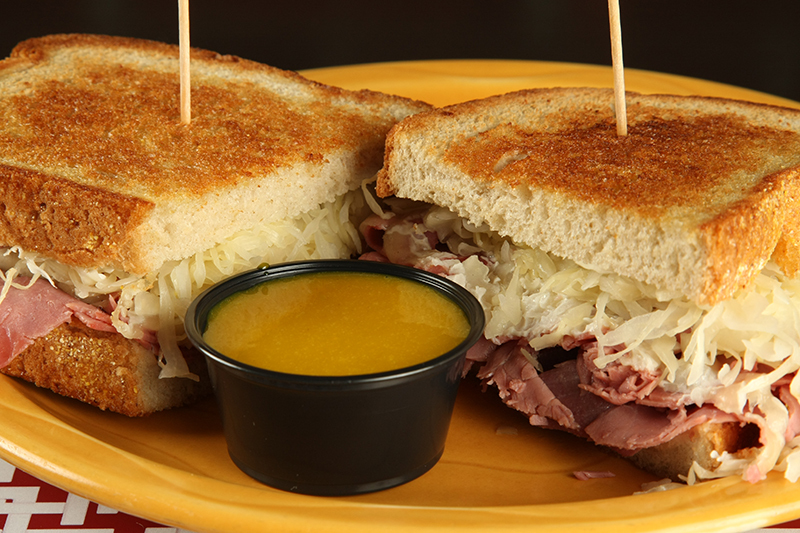 Corned beef, swiss cheese, sauerkraut, homemade honey mustard. 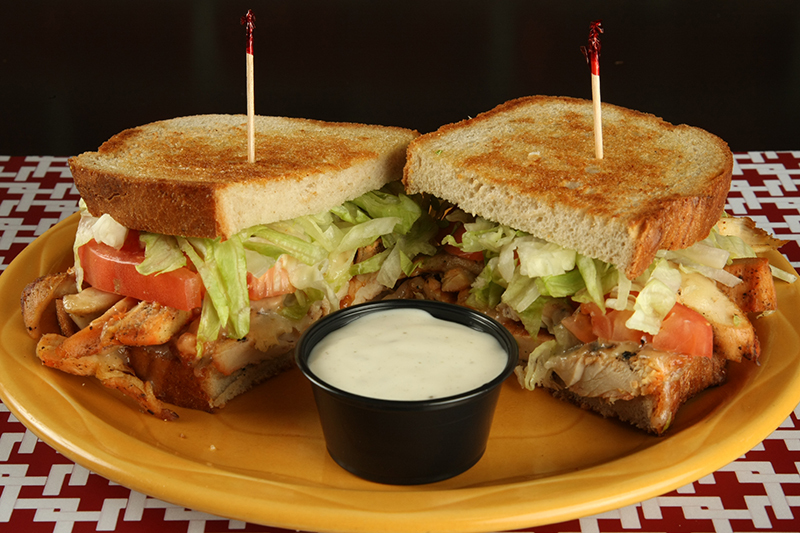 Grilled chicken breast topped with swiss cheese, lettuce, tomato and ranch dressing. 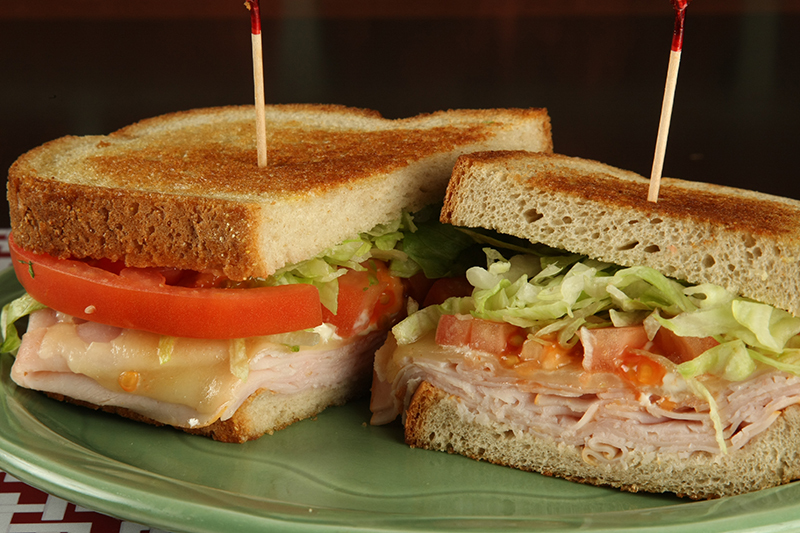 Turkey breast, swiss cheese, lettuce, tomato, mayonnaise. 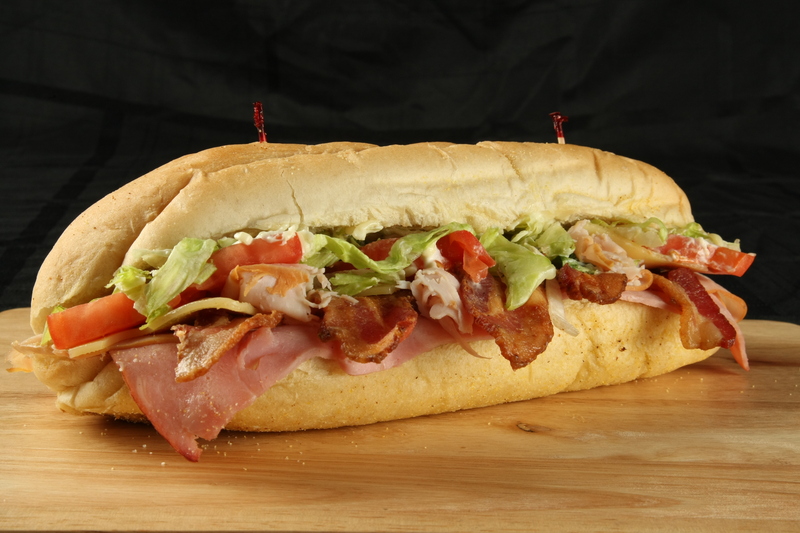 Ham, turkey breast, swiss cheese, bacon, lettuce, tomato and mayonnaise. Grilled on soft rye bread. 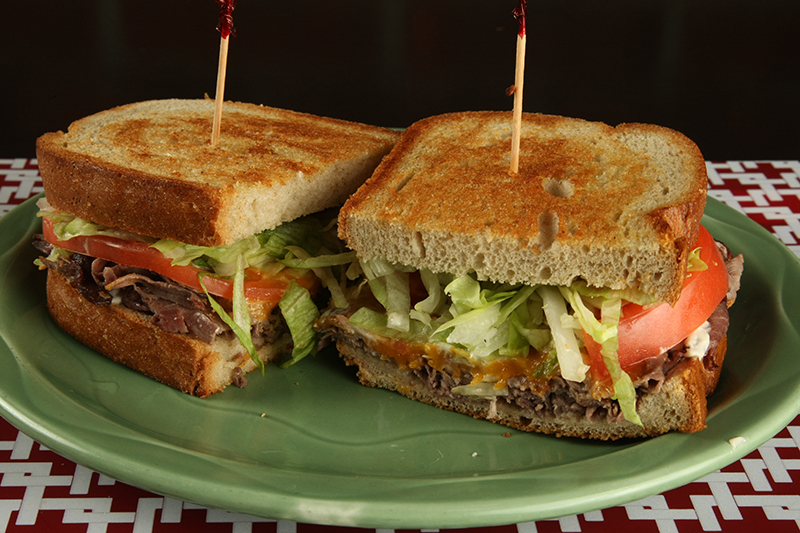 Roast beef, cheddar cheese, lettuce, tomato and mayonnaise. 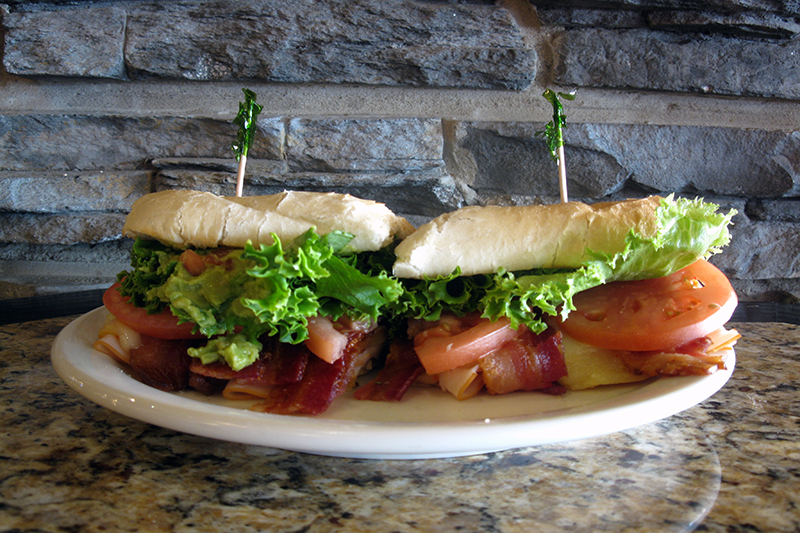 Bacon, swiss cheese, lettuce, tomato and mayonnaise. 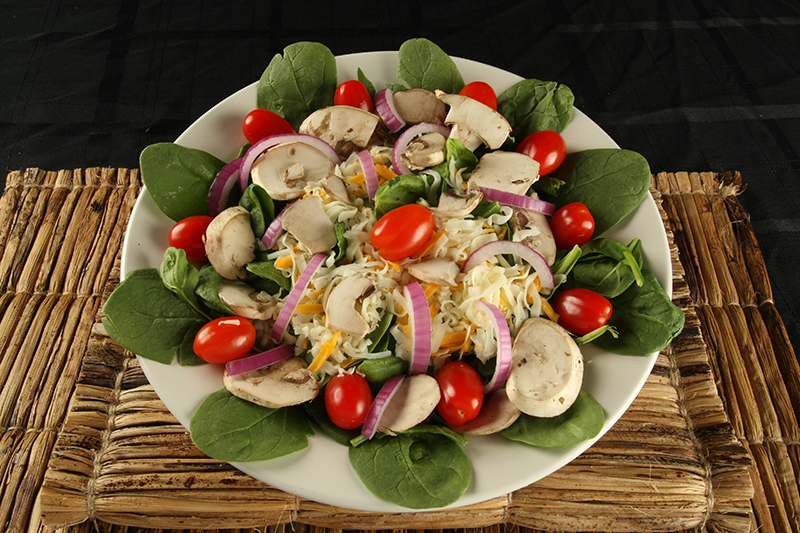 Sautéed mushrooms, onions and green peppers, topped with swiss cheese, spinach & served with a side of ranch. 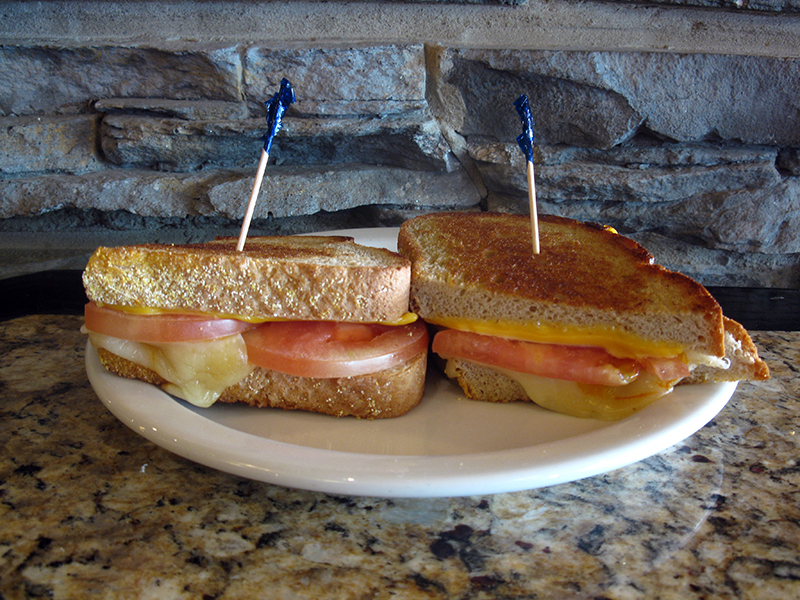 Mozzarella, muenster & american cheese topped with tomatoes and oven baked. 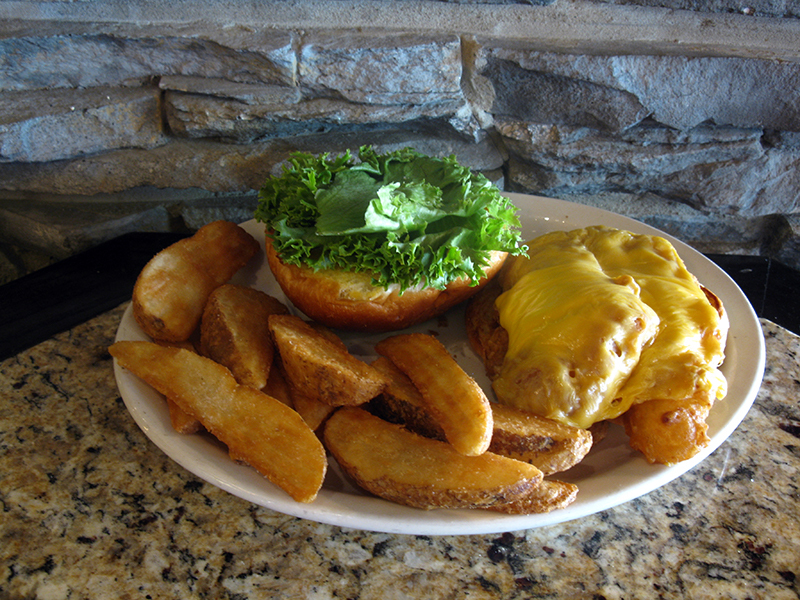 Slightly spiced redfish, breaded and deep fried topped with American cheese and served on a bakery bun with lettuce and tartar sauce.